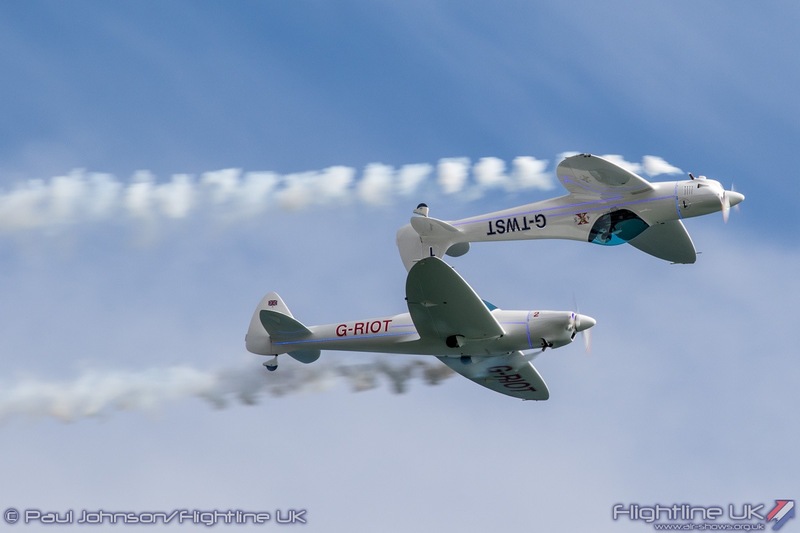 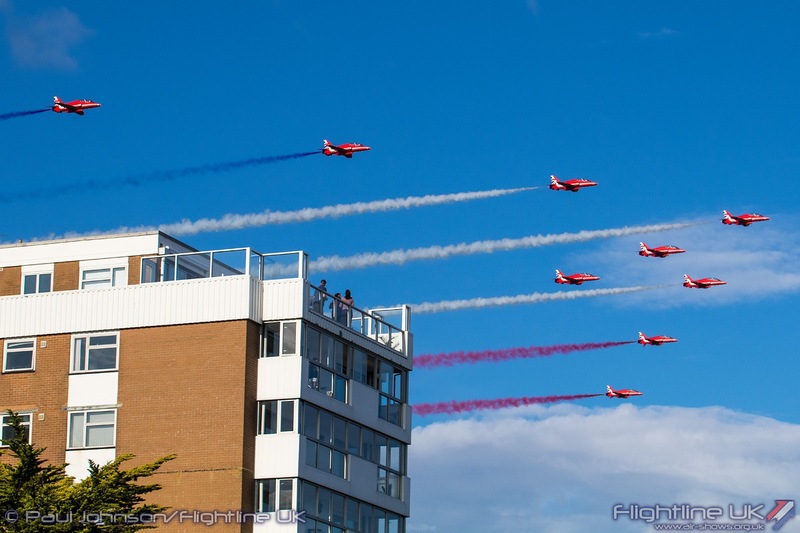 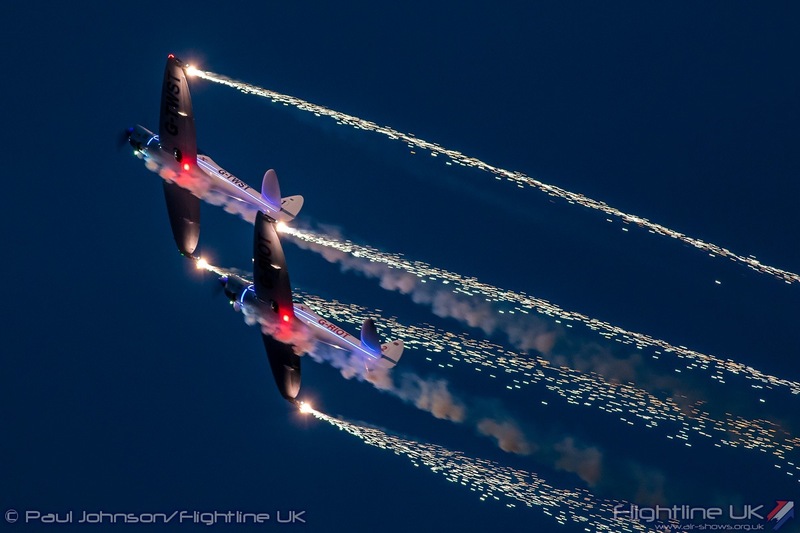 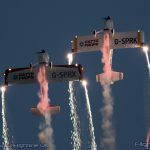 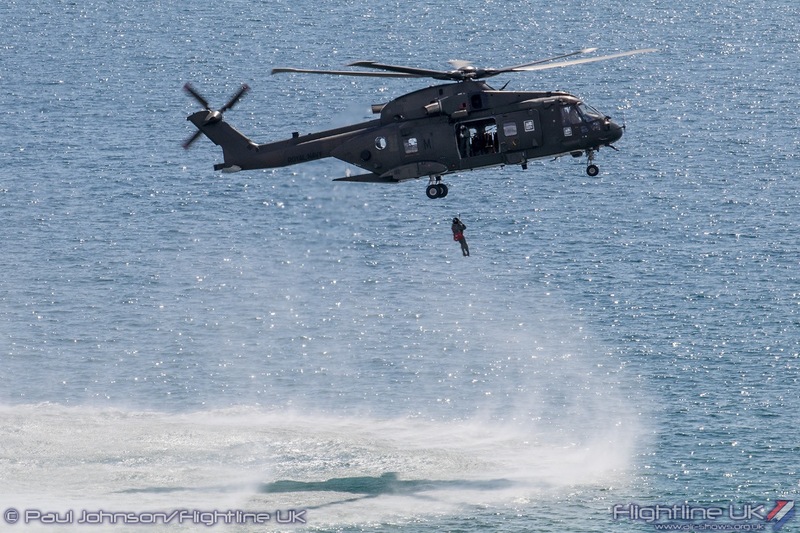 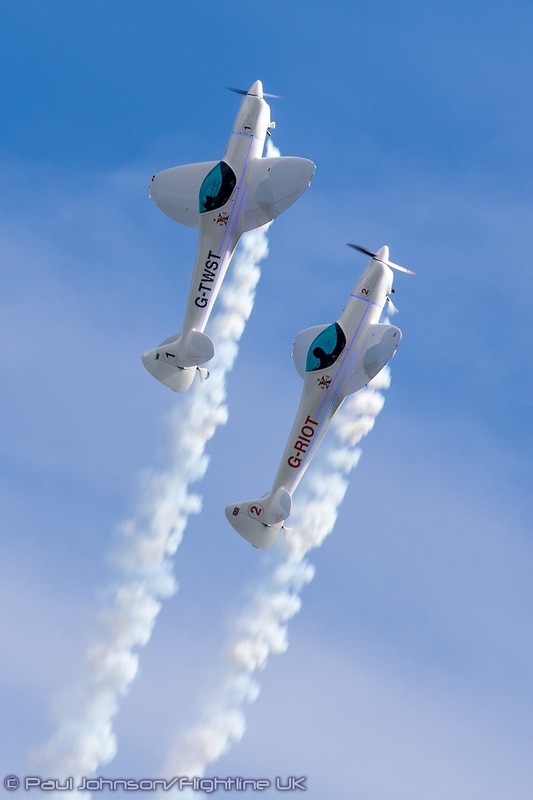 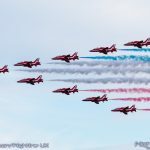 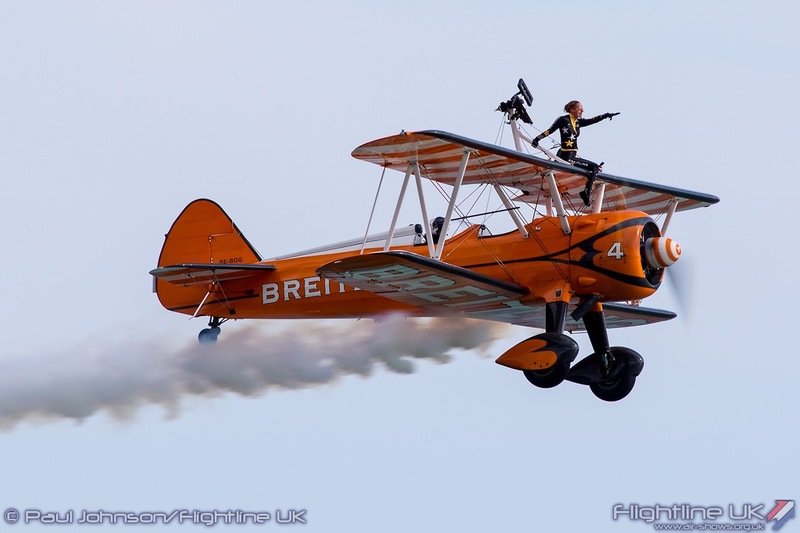 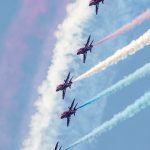 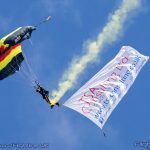 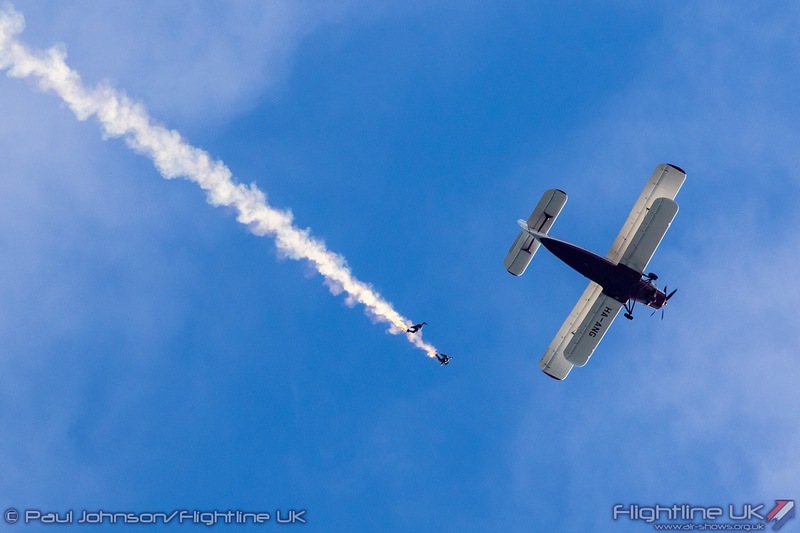 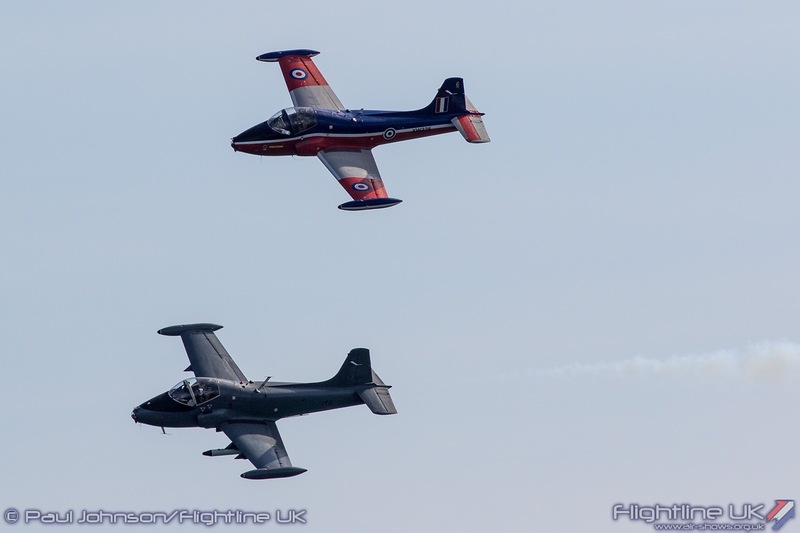 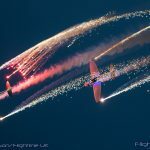 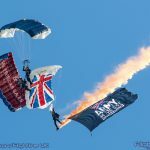 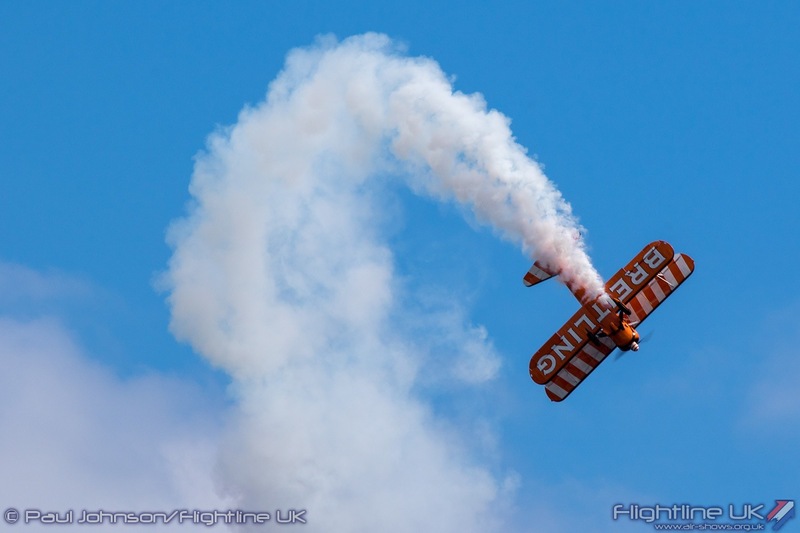 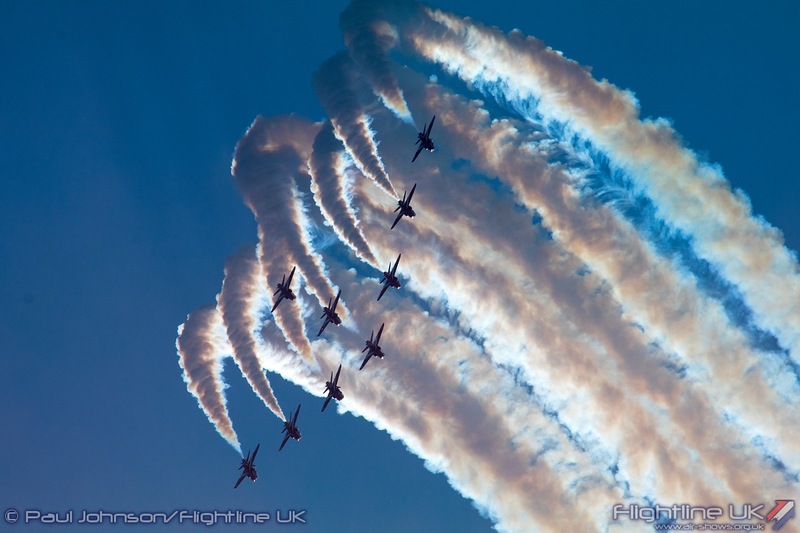 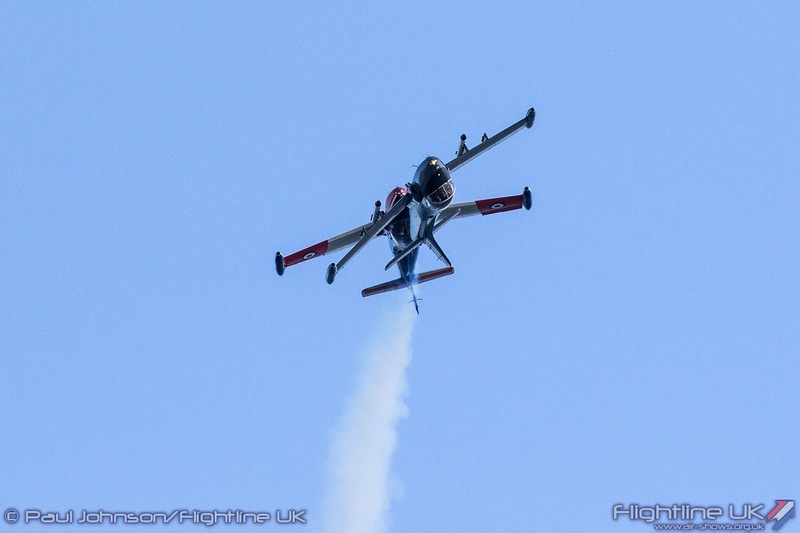 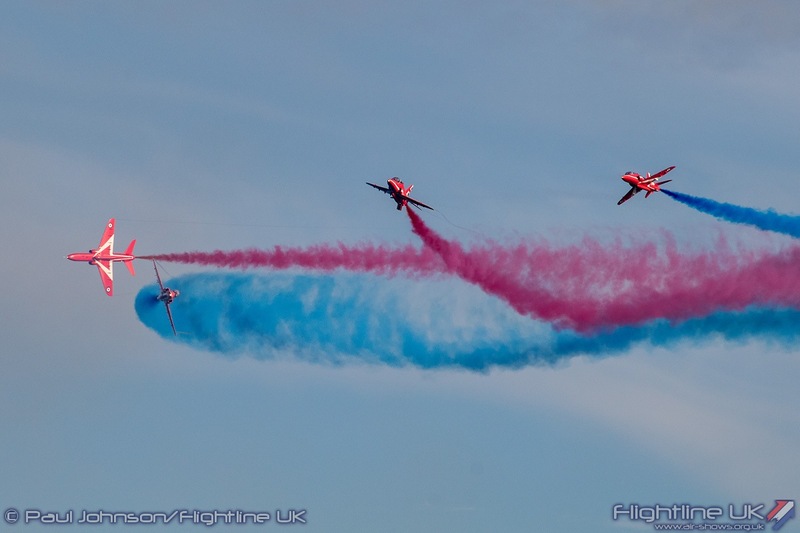 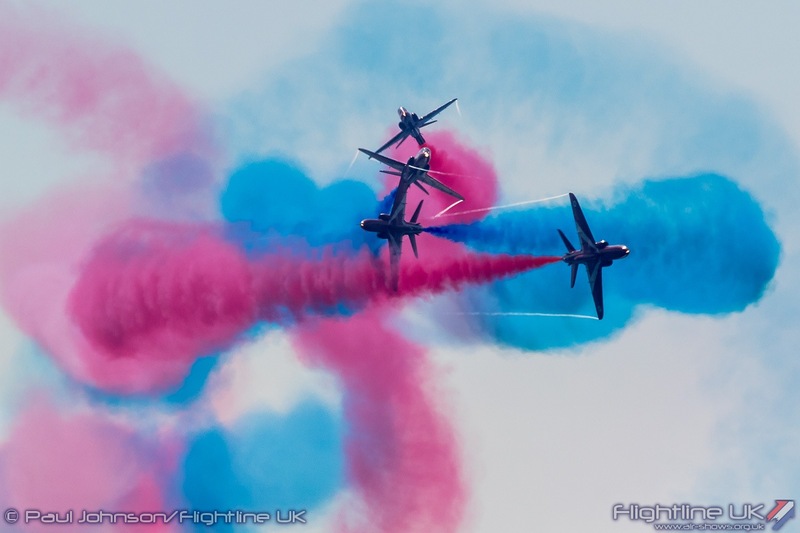 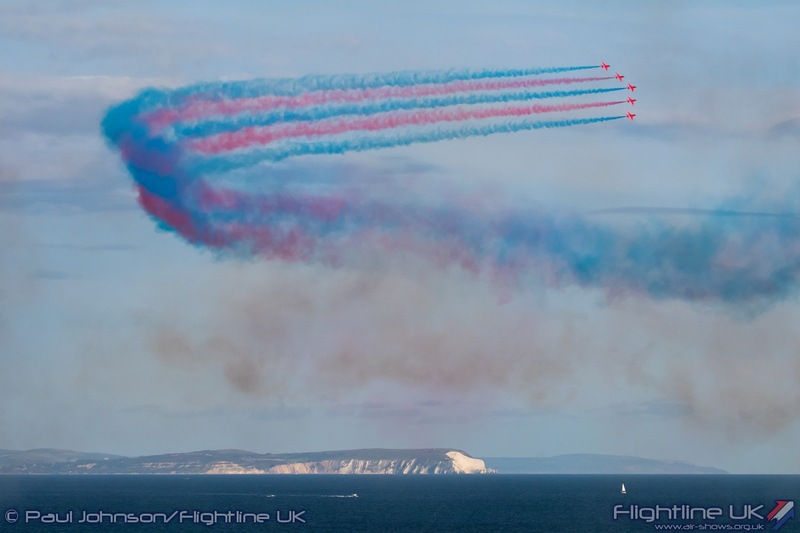 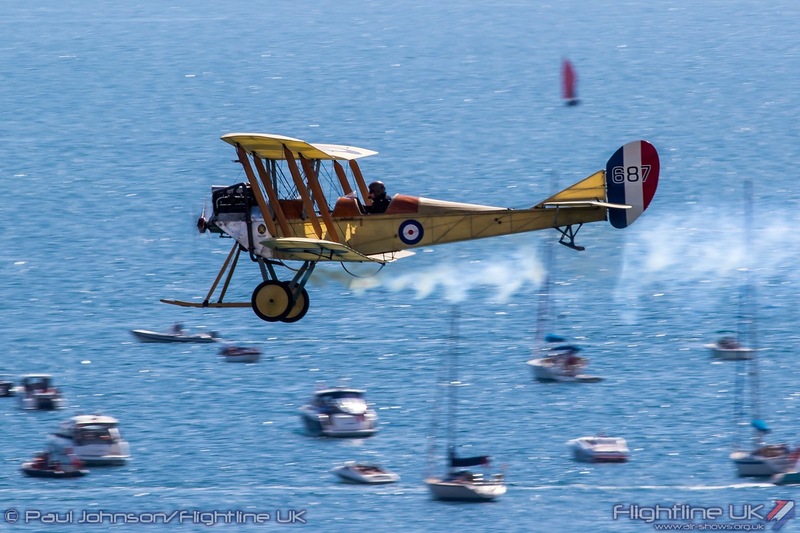 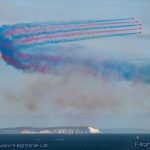 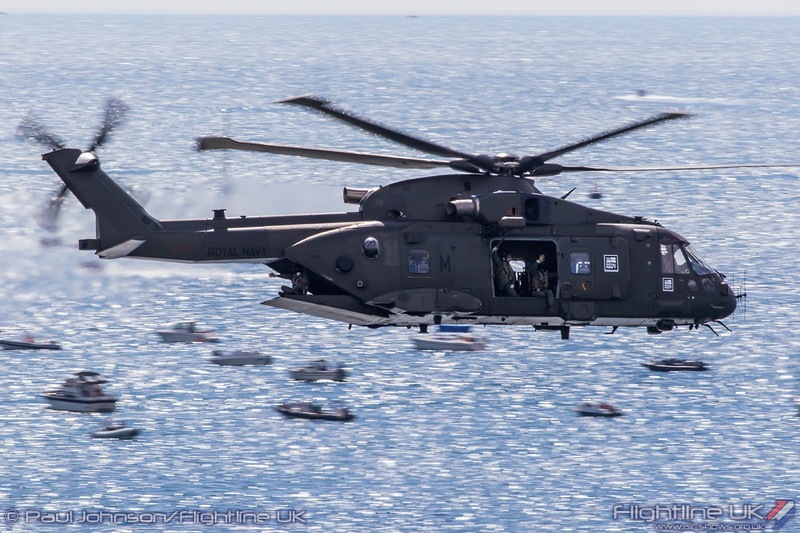 Bournemouth Air Festival celebrated its 10th Anniversary this year. 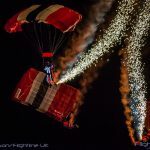 The event has become one of the most popular of the year regularly attracting audiences of over 1 million each year. 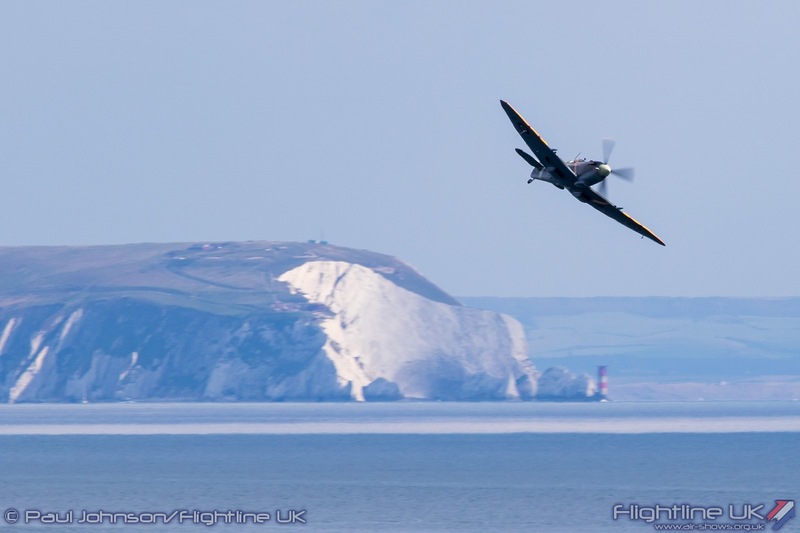 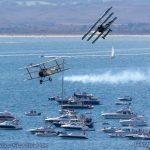 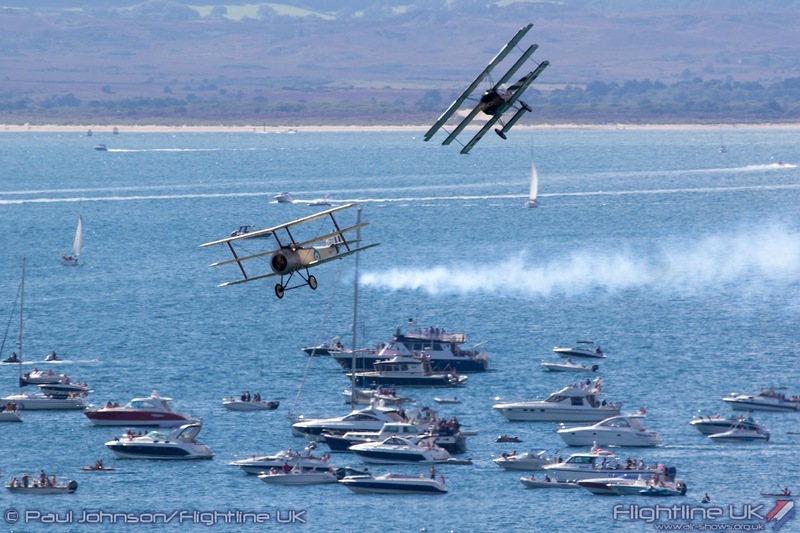 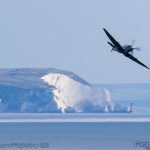 The huge draw of the festival and the stunning Dorset coastline has also meant it has become favourite amongst the many display teams which have performed there over the years. 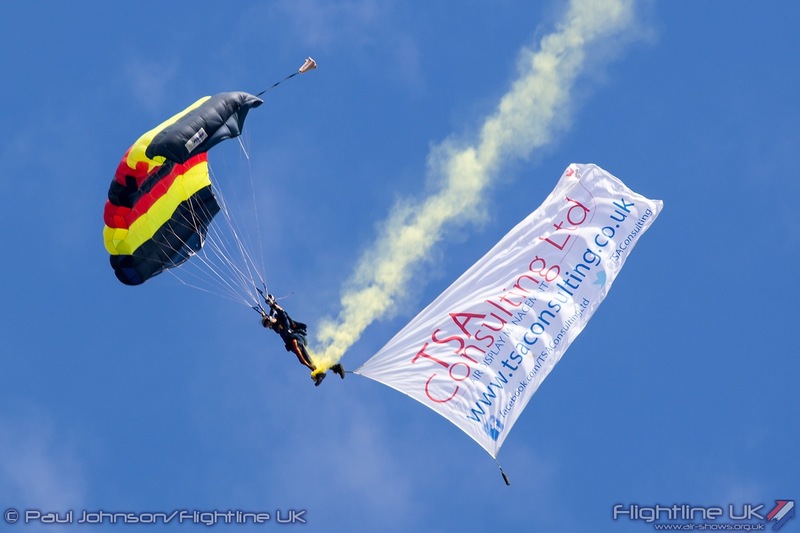 There were those who did not think the Bournemouth Air Festival would last longer than a few years. 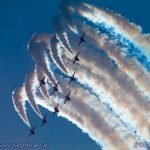 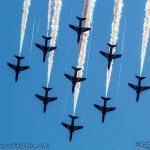 In many ways, it was fortuitous that the decision to hold the first Air Festival was taken in 2007 as a year later the growing financial crisis may have precluded the large commitment required by the Council. 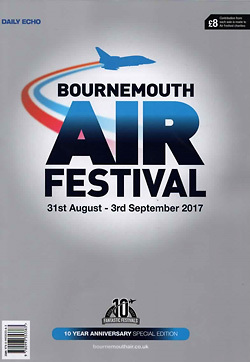 The 2007 event was an immediate hit and Bournemouth soon cemented its position on the display circuit as one of the premier seaside shows. 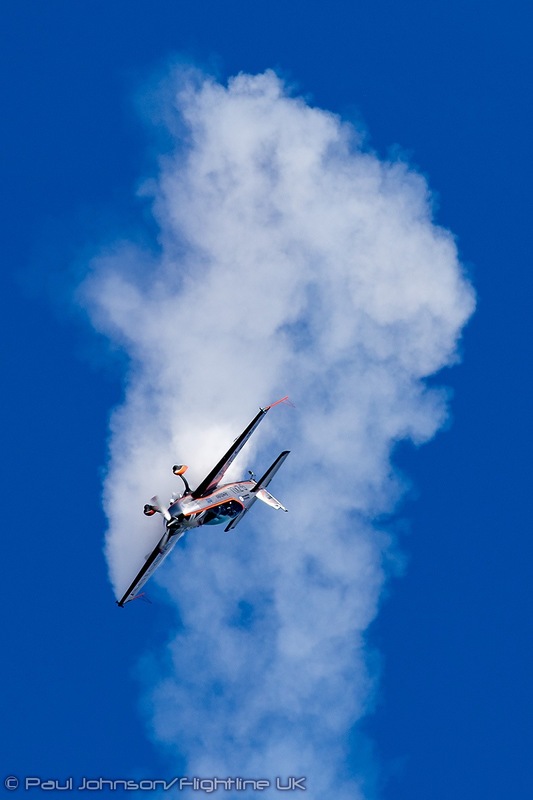 The show has not stood still and has always brought in new features and developed them. 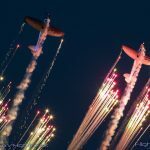 Perhaps the most significant are the Night Air Dusk air displays. 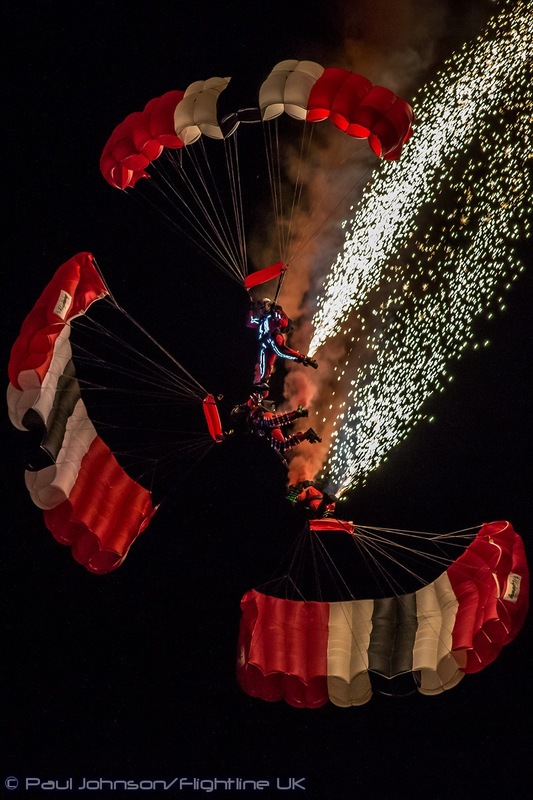 From an experiment on a Thursday night in 2010 they have now become one of the main attractions being held all three nights during the four-day festival. 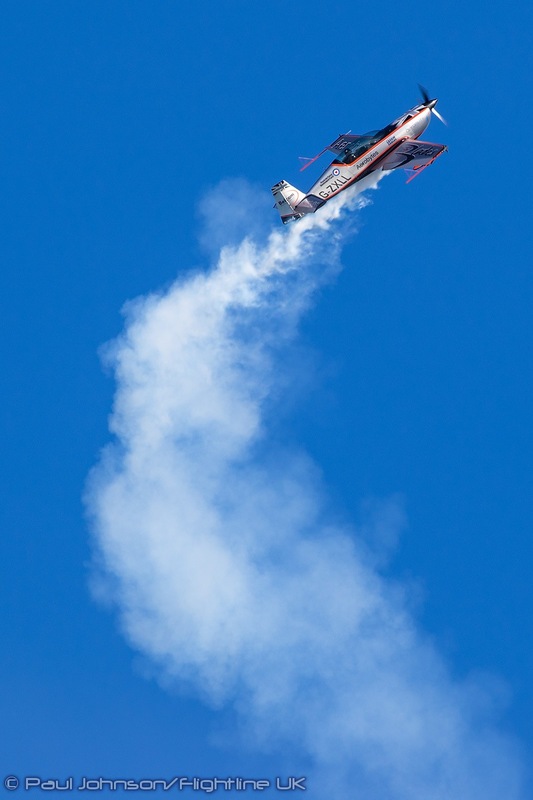 The show has not been without its highs and lows. 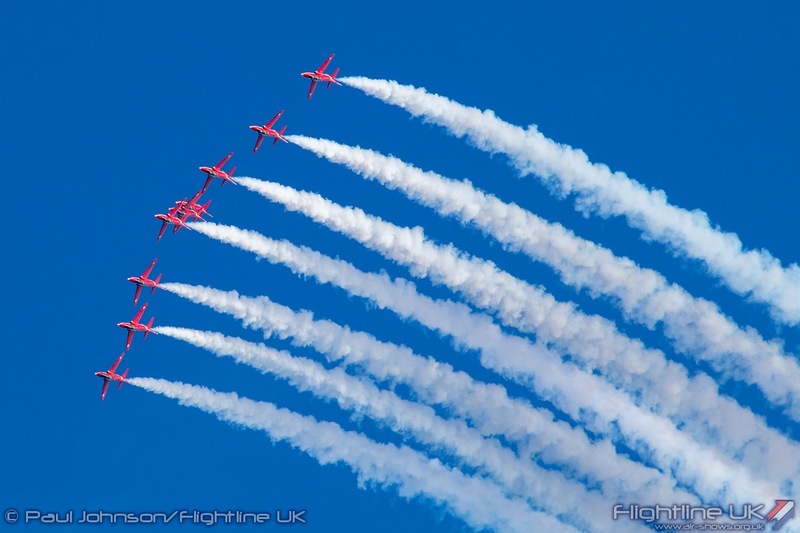 2011 was a particularly challenging year which saw the first day of the event wiped out by flooding and the tragic loss of Red 4, Flt Lt Jon Egging following the Red Arrows performance on the Saturday. 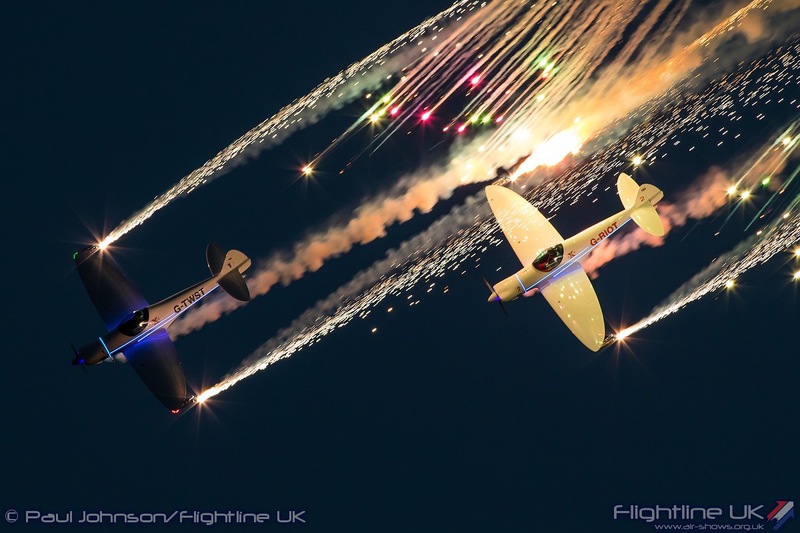 Those two events really tested the Council and all the airshow staff but they showed really commendable commitment and resolve making sure the event continued in very difficult circumstances. 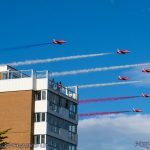 Bournemouth has always been a massive event drawing in hundreds of thousands of spectators but retains a very relaxed and friendly atmosphere with entertainment from morning well into the evening. 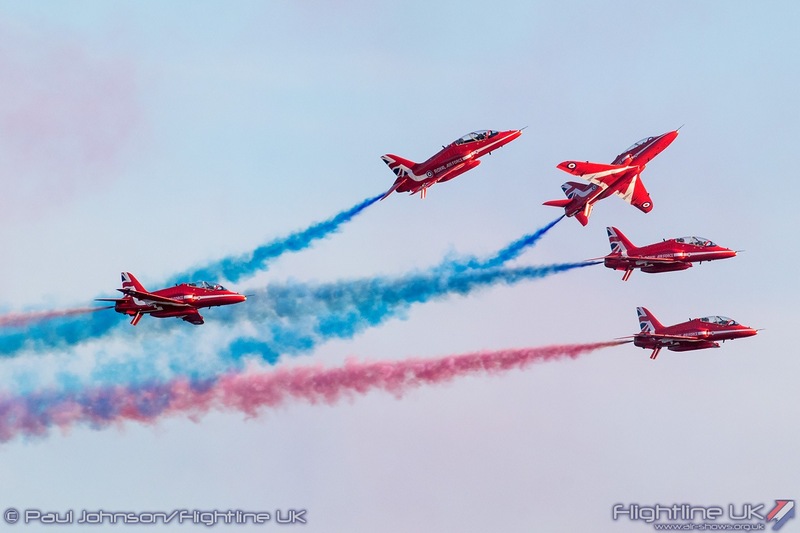 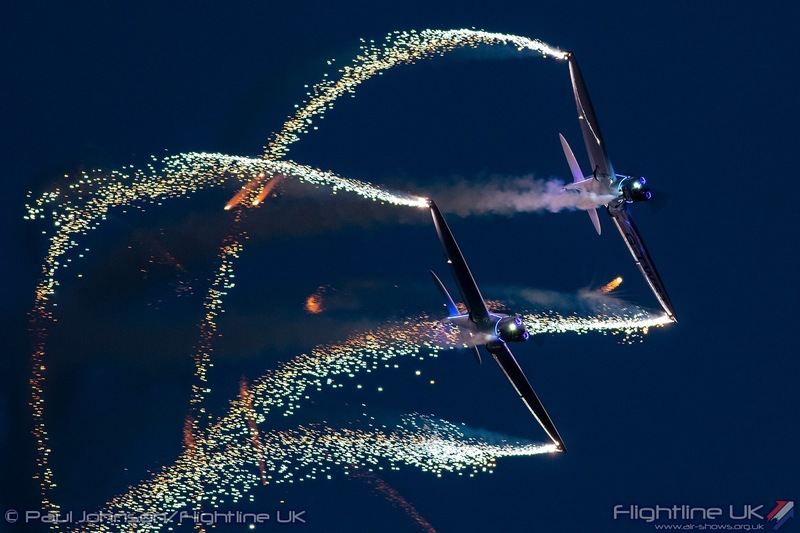 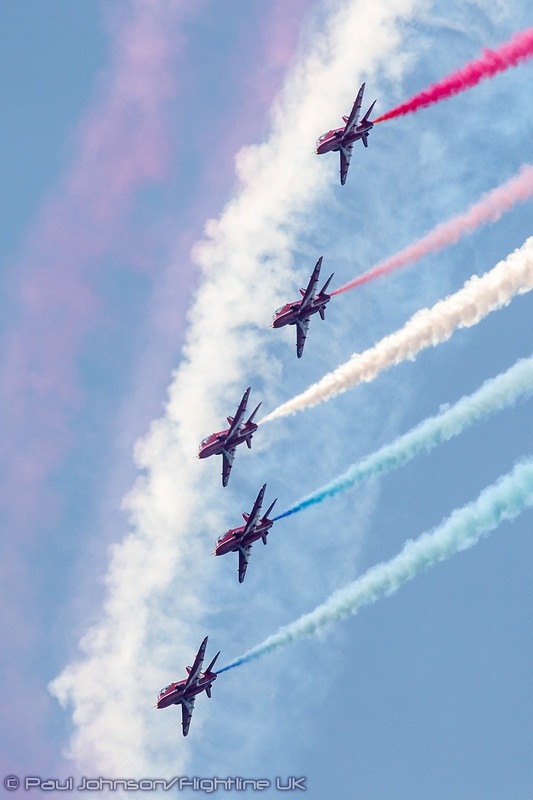 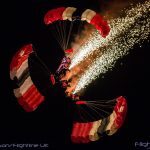 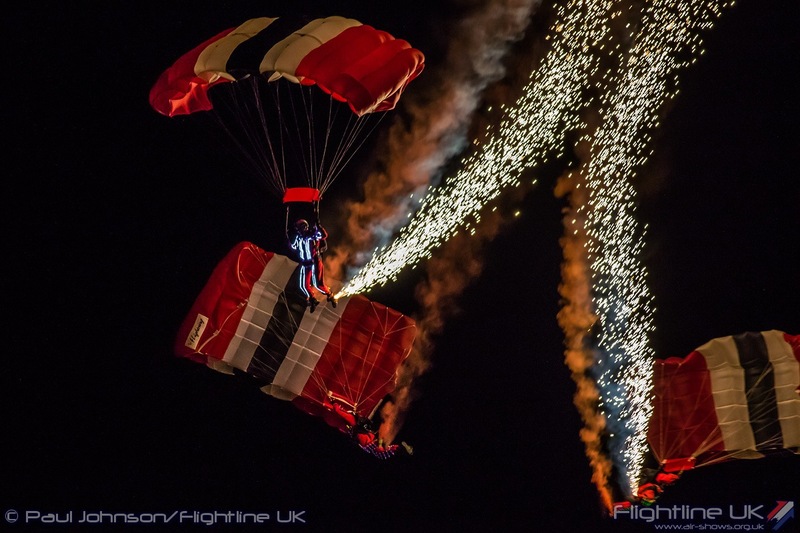 As well as the flying displays, other regular entertainment includes Unarmed Combat Demonstrations by the Royal Marines and a Royal Navy “Beating the Retreat” on cliff-top lawns, a large Military village area as well as night-time concerts and fireworks on the beach. 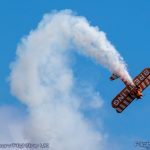 Every airshow faces challenges each year. 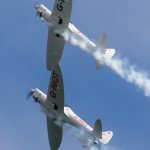 In its 10th anniversary year Bournemouth shared its weekend with two other large seaside events in Scotland and Northern Ireland. 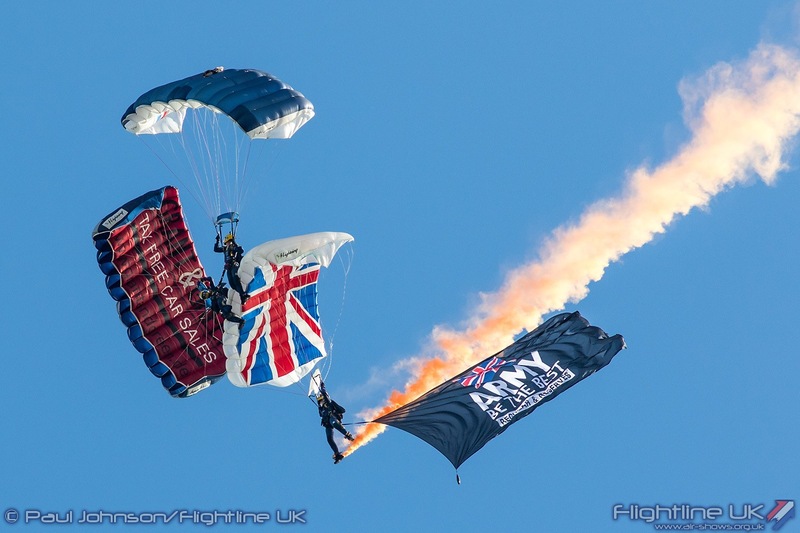 With the very limited military display assets on offer during 2017 the RAF Events Team in particular was faced with a difficult task spreading what they had the various venues. 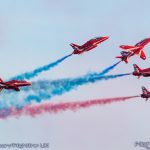 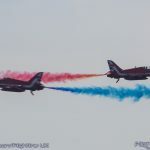 IN the event that meant that just the RAF Red Arrows for the first three days and Battle of Britain Memorial Flight were allocated to the event. 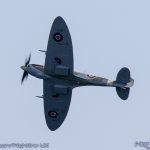 Sadly, in the weeks before the festival the BBMF were forced to withdraw after a pause in flying of their Merlin powered aircraft. 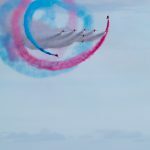 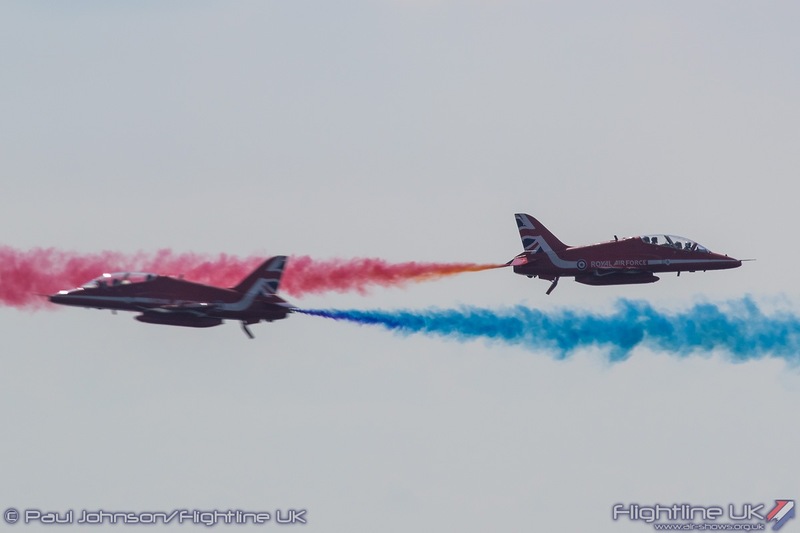 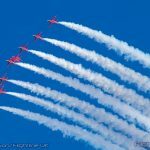 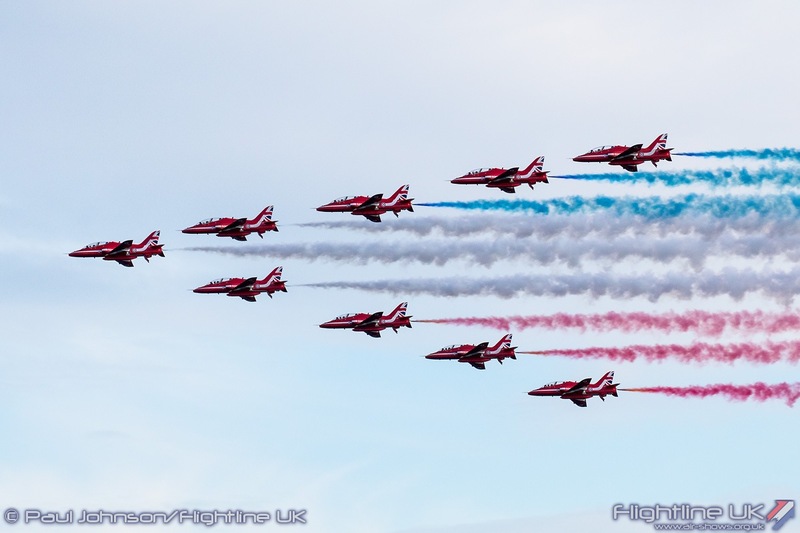 However, the presence of the Red Arrows for the first three days was a big boost for the show and the town with have such a close relationship with the team. 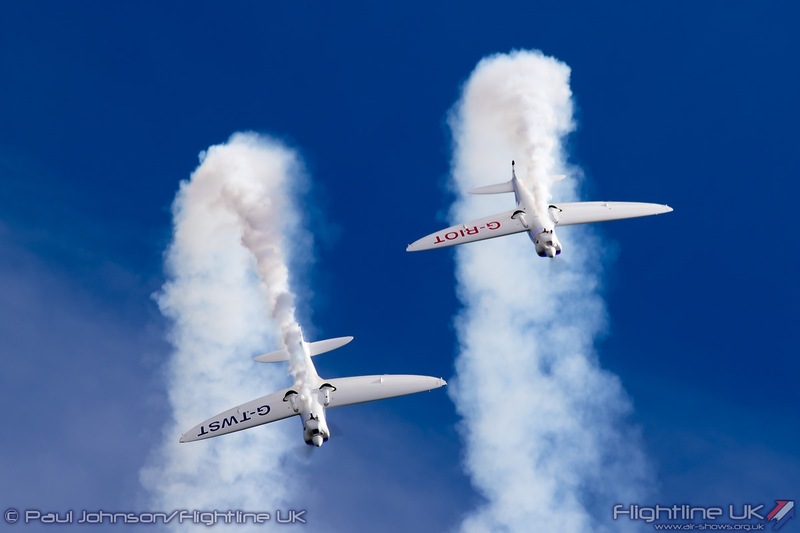 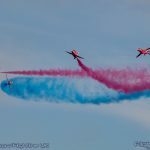 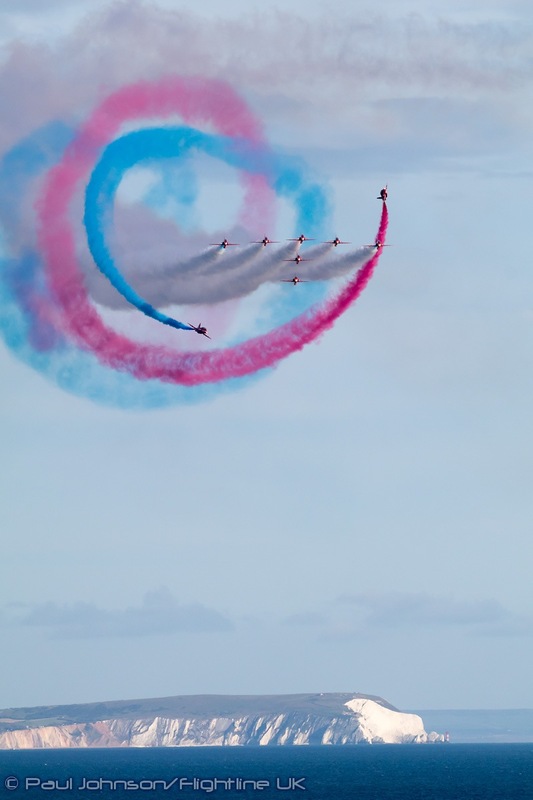 With fine weather, the team were able to put in full displays on each day to the delight of spectators who always love to the see the Synchro-Heart and the big loop on arrival. 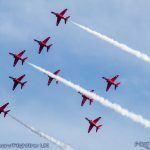 Throughout the weekend there were some nice little moments for the Reds. 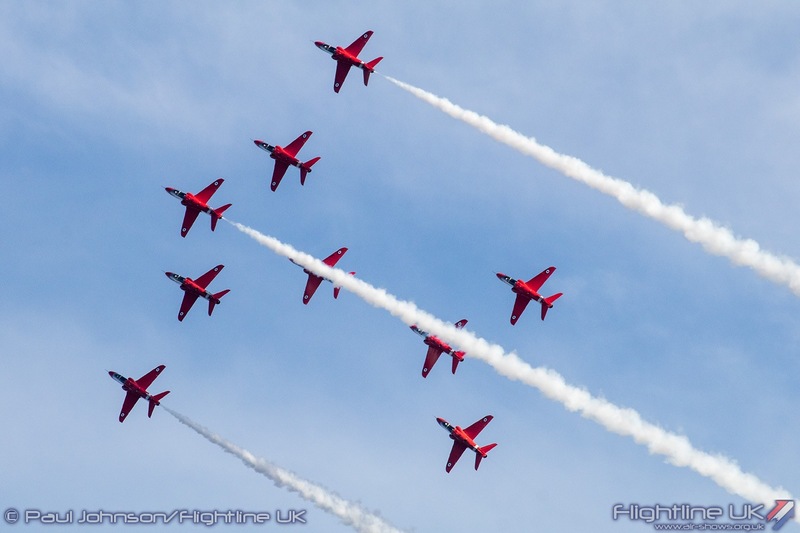 A special presentation was made to Red 10, Sqn Ldr Mike Ling on the Thursday from the Bournemouth Red Arrows Association to mark his contribution to the team and Bournemouth. 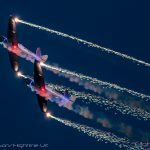 On Saturday as the Reds closed their final performance, Red 1 Sqn Ldr David Montengro spoke live from the cockpit to thank Bournemouth as “the biggest and best audience” that team performs to. 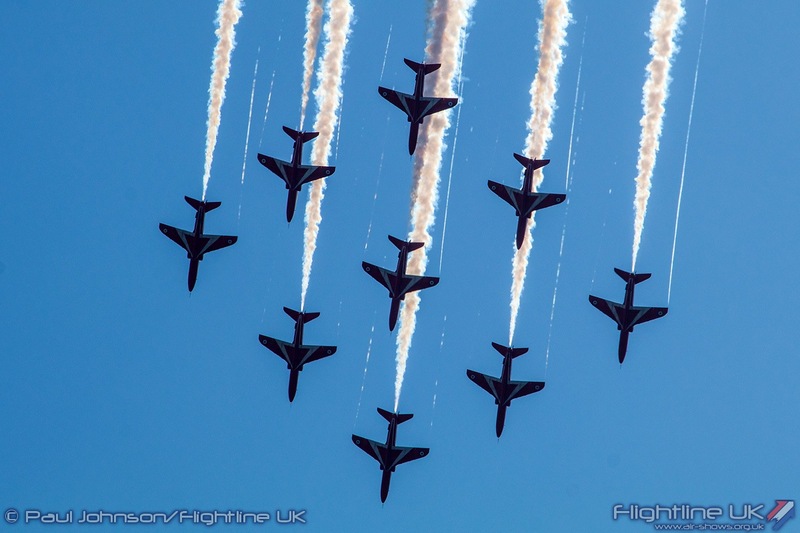 The Red Arrows were not the only representatives of the Royal Air Force seen in the air. 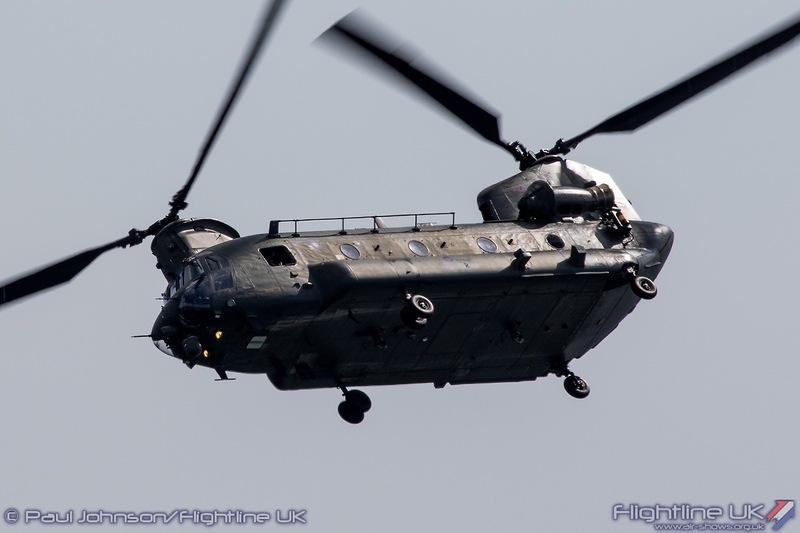 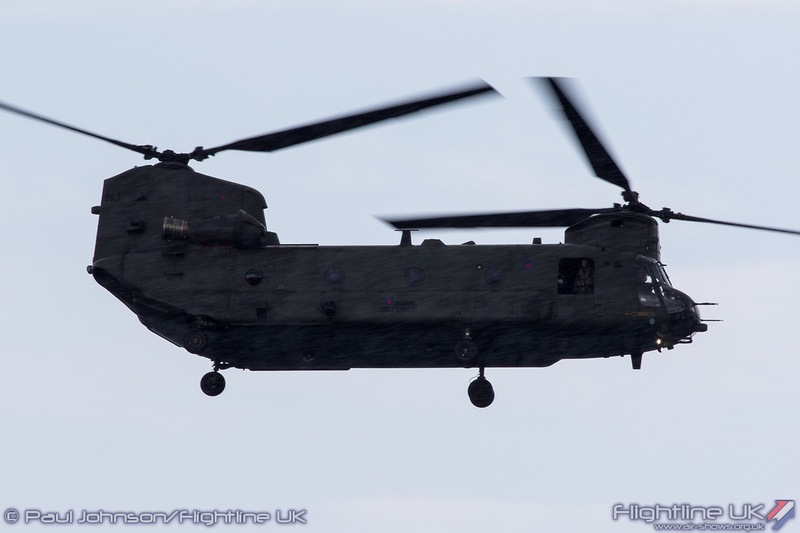 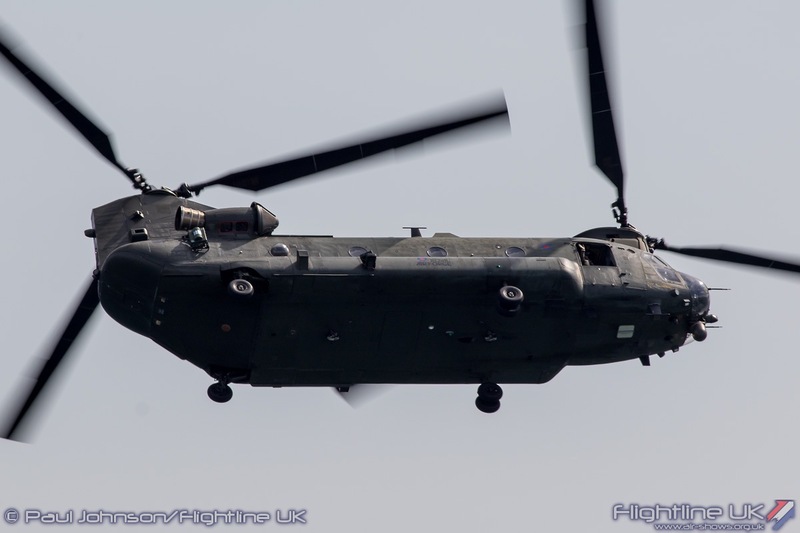 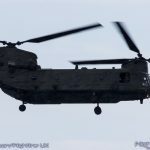 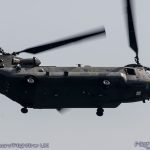 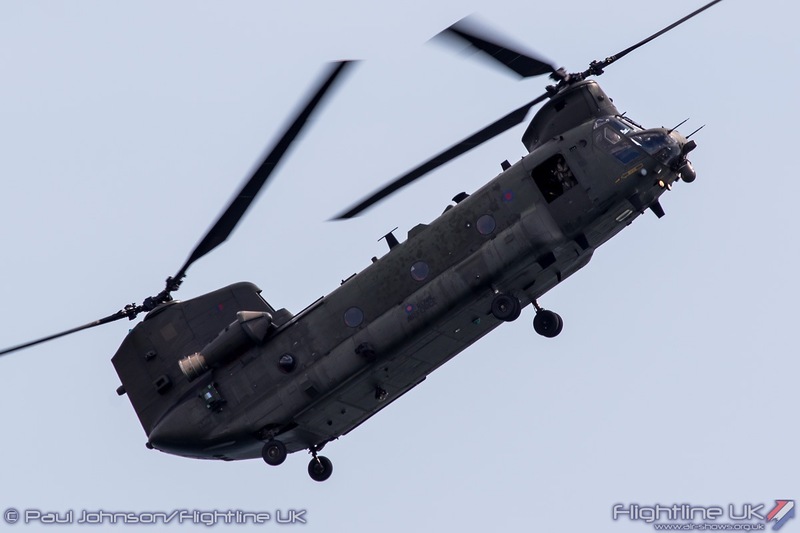 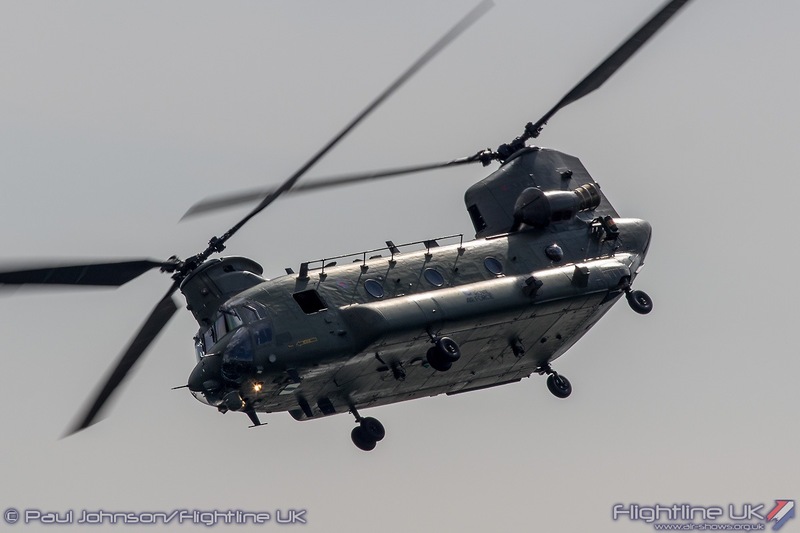 Opening the Air Festival Flying displays on the Thursday was a flypast from a Boeing Chinook HC4 from 27 Squadron based at RAF Odiham. 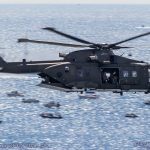 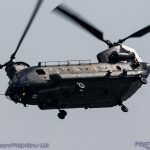 Friday saw the Chinook Display Team make a very welcome return to Bournemouth for their final public display of the 2017 season. 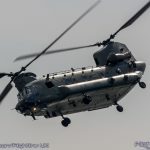 For operational reasons, the team have only appeared at a few select events this season, but their display is an impressive as ever showing the amazing abilities of the Chinook and creating plenty of blade-slap – we hope they are able to return next year! 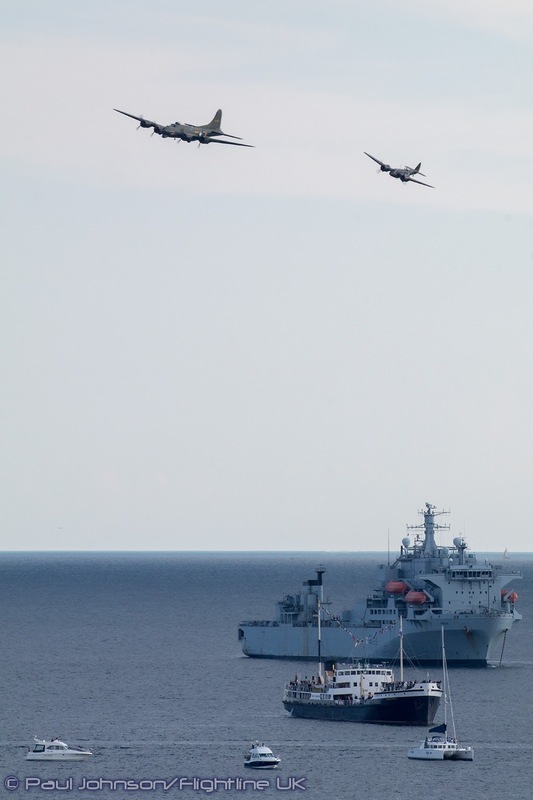 Bournemouth is always an important venue for the Royal Navy. 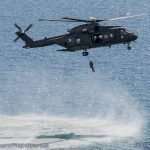 Friday, Saturday and Sunday all saw a combined Royal Navy and Royal Marines Beach Assault with the RFA Argus providing the command platform. 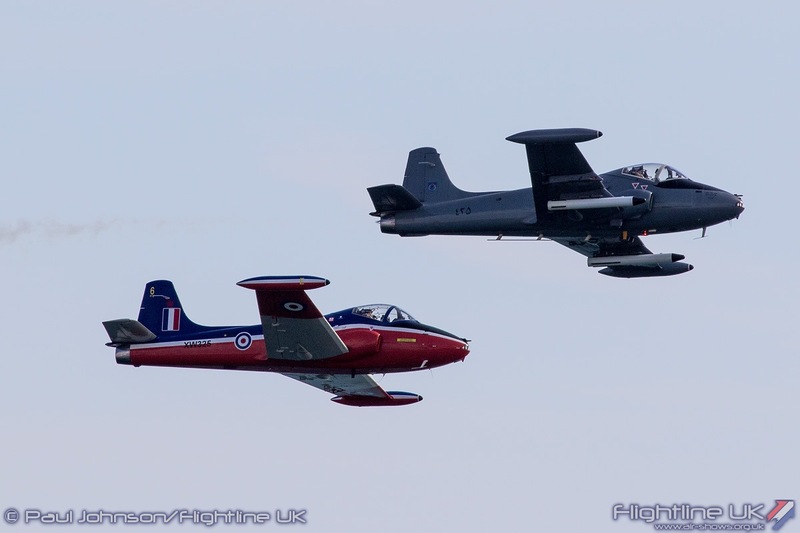 Due to on-going operation commitments, it was a little lower key that usual but still involved a Leonardo Merlin iHC3 from 846NAS and two BAE Systems Hawk T1s from 736NAS. 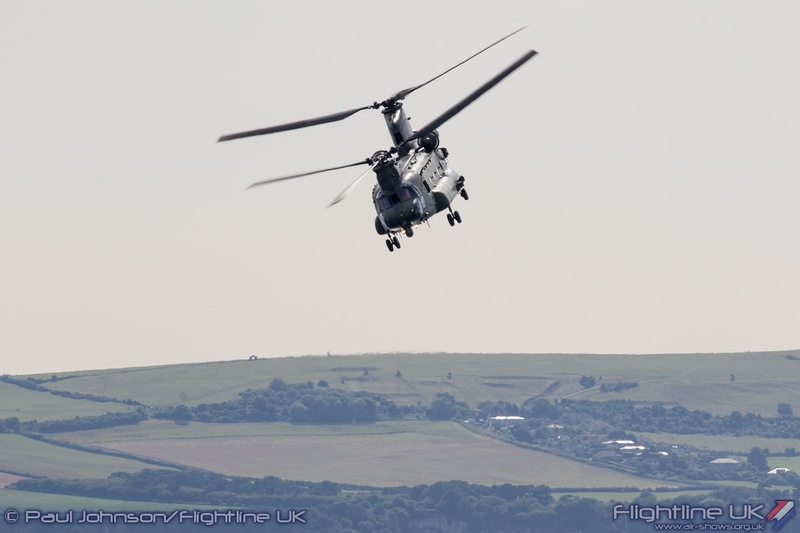 The scenario centred on the Navy’s anti-piracy operations with Marines tasked with finding and eliminating pirate camps with the aid if the aircraft and Viking assault vehicles. 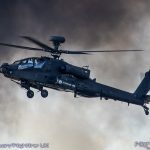 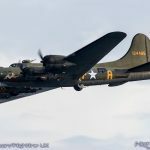 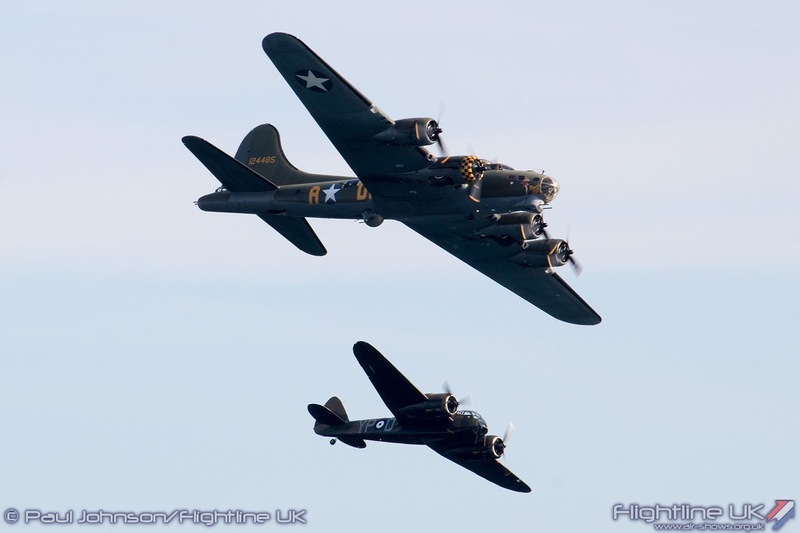 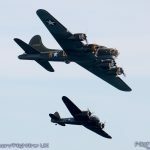 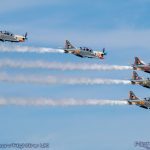 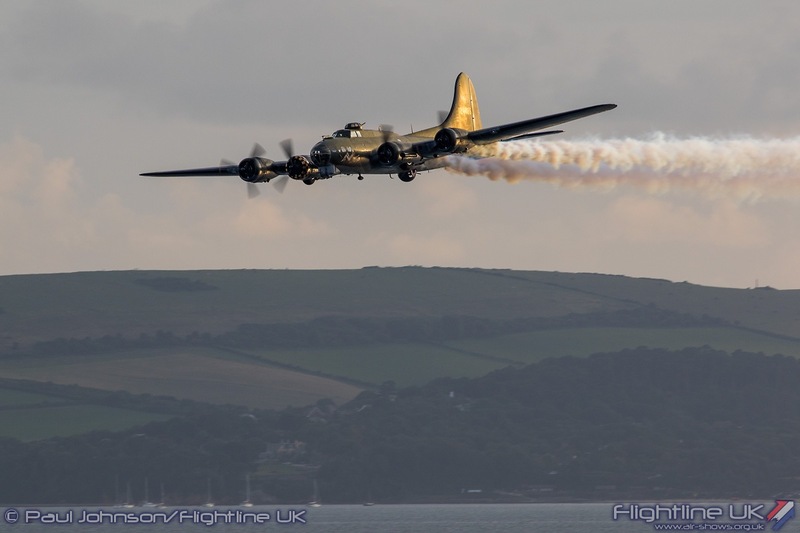 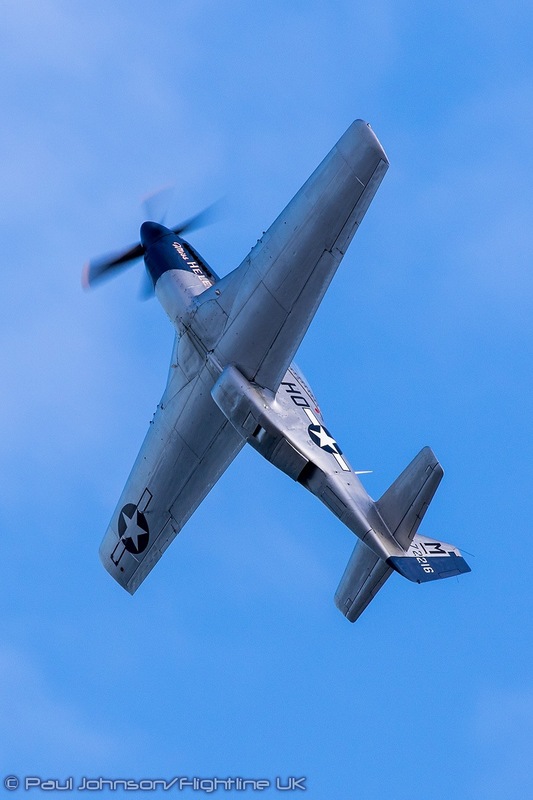 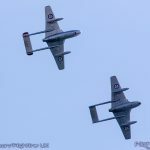 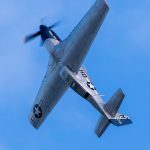 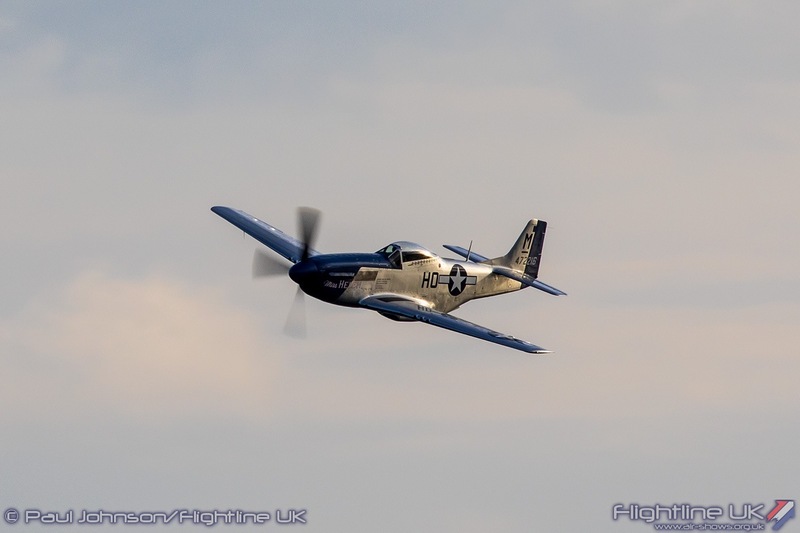 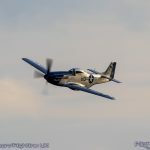 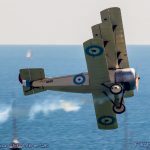 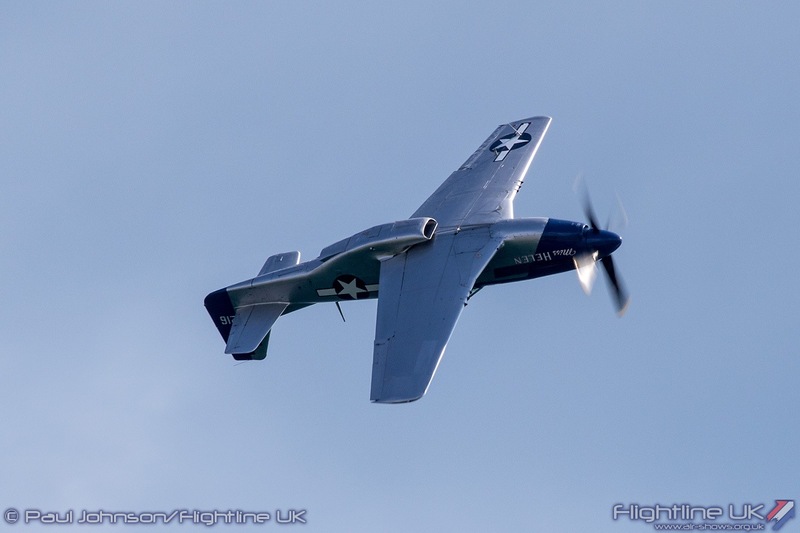 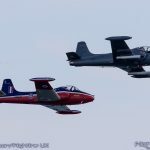 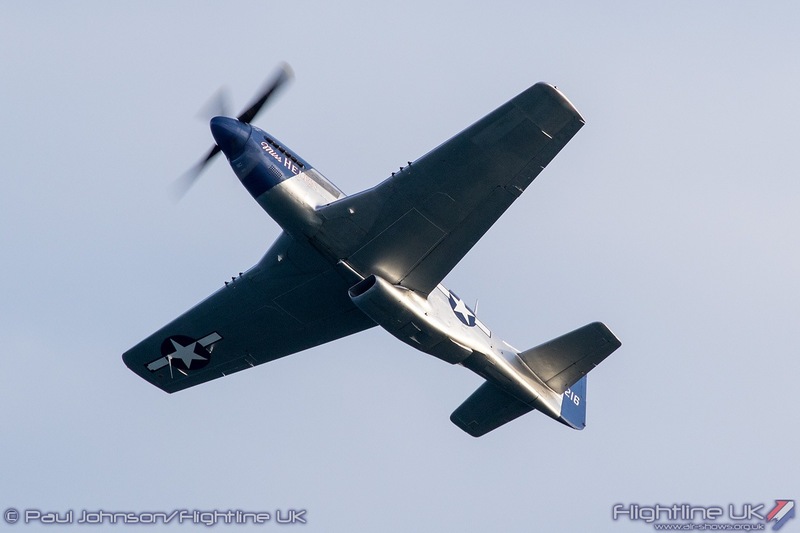 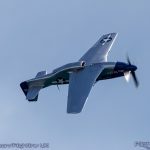 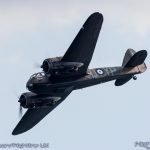 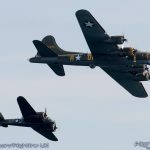 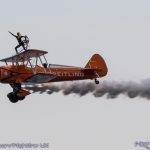 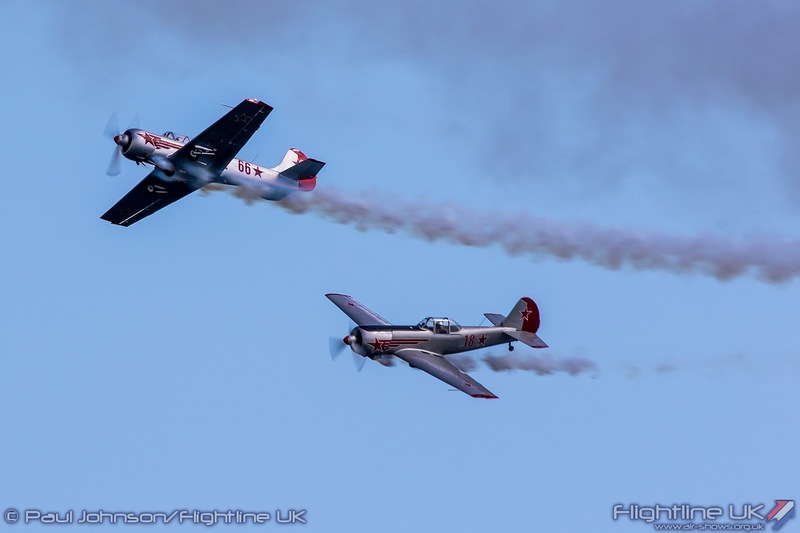 The lack of modern military displays led to the Air Festival taking on a more vintage theme for the flying displays bringing together more warbirds and classic jets than had been seen at the Air Festival before. 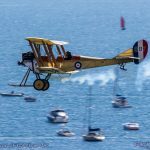 Sadly the planned “Vintage Sunday” flying display didn’t go ahead due to poor weather that affected much of the western half of the UK. 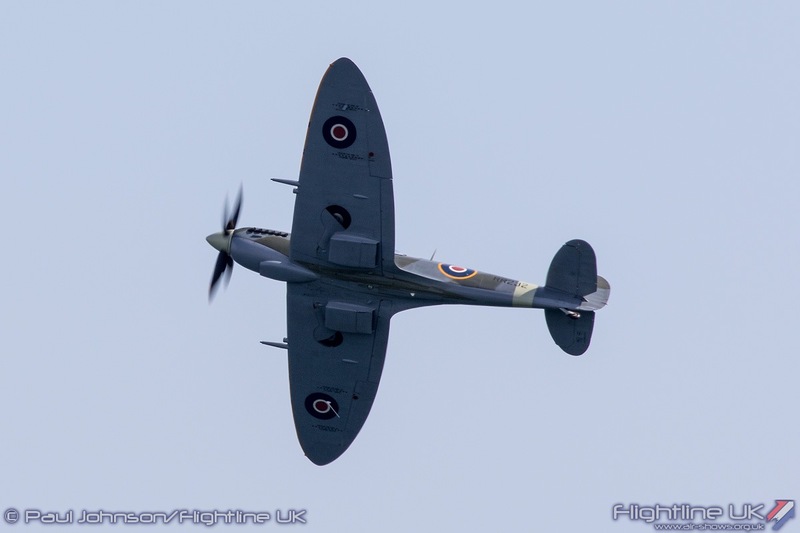 However, almost all of the aircraft that would have participated on Sunday were seen over the first three days. 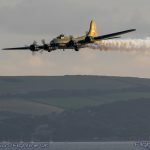 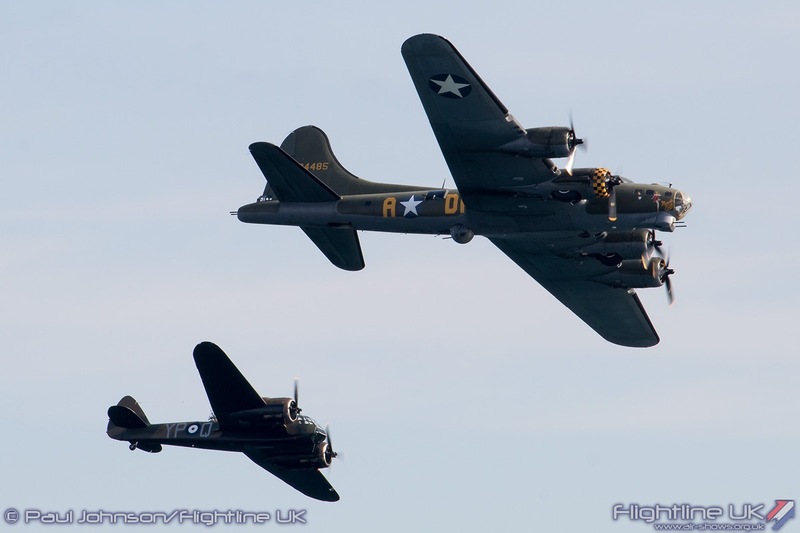 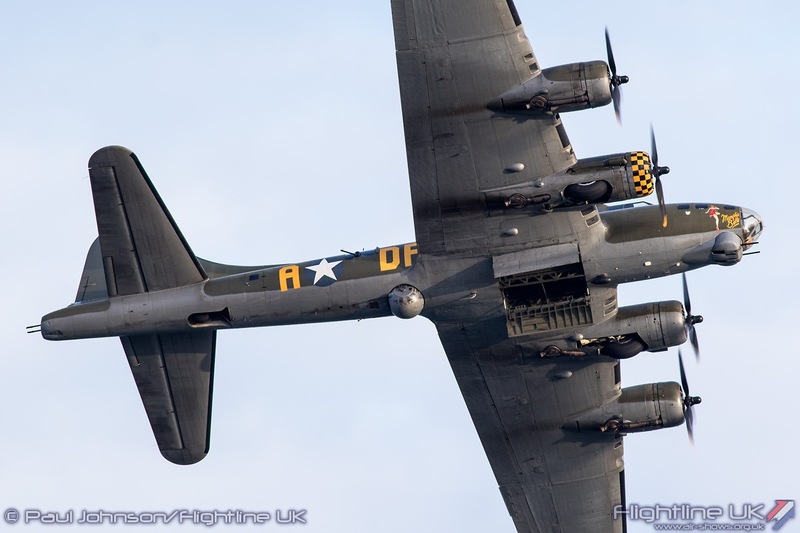 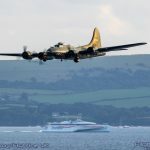 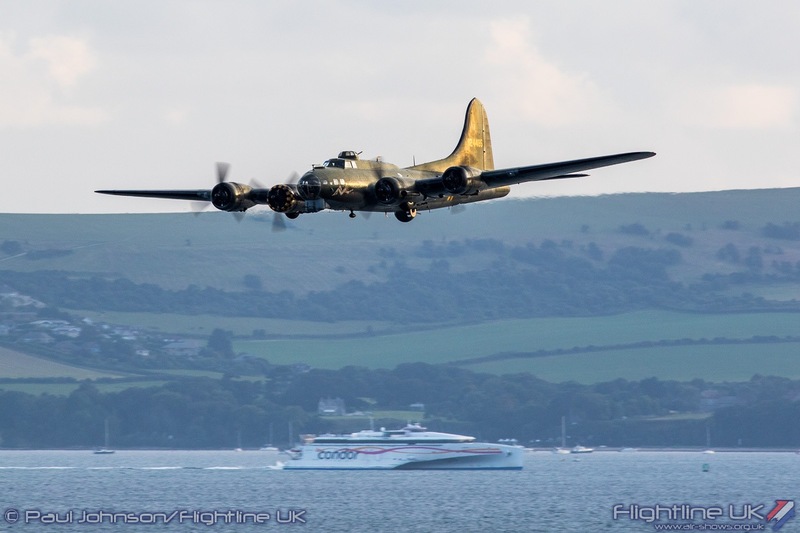 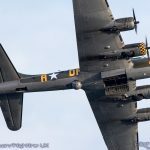 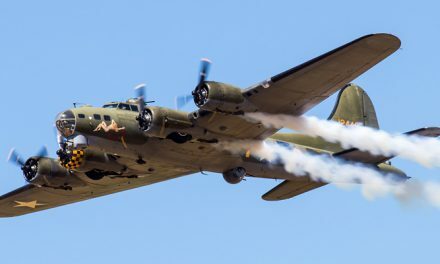 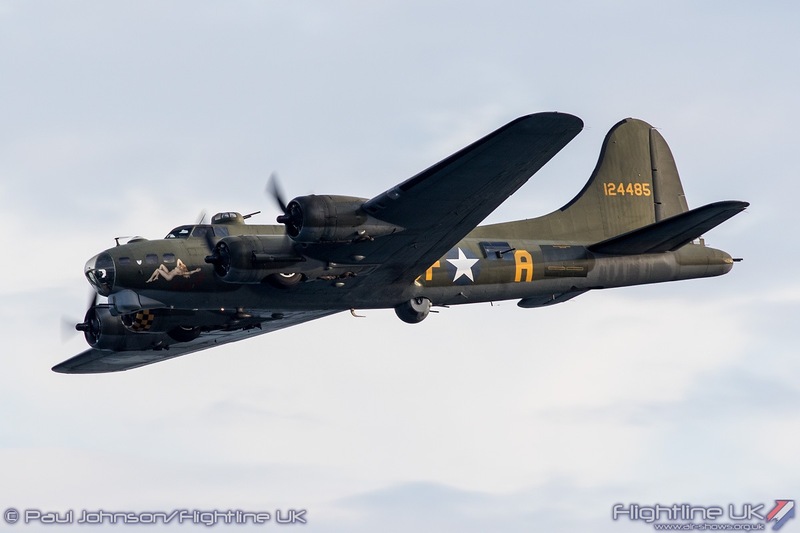 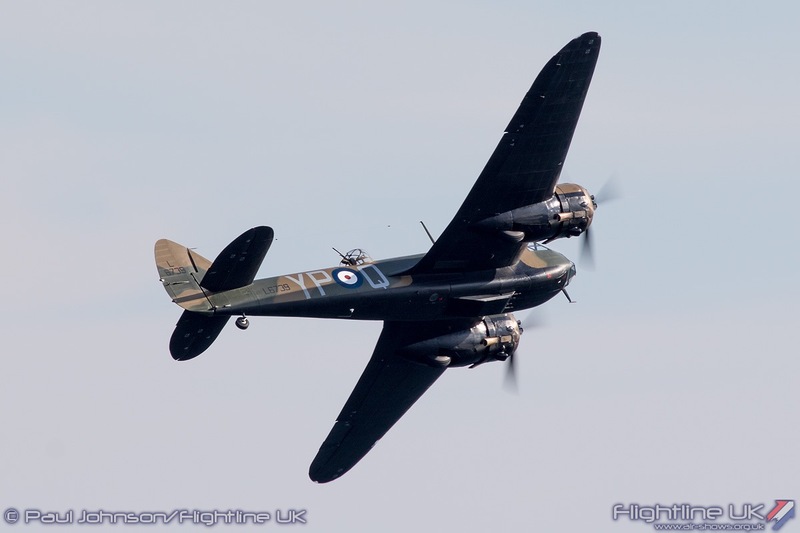 The stars of the warbird line-up were the Boeing B-17G Flying Fortress “Sally-B” and the Aircraft Restoration Company’s Bristol Blenheim 1F flown by John Romain. 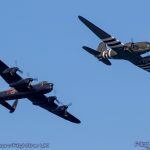 Both performed a solo display items, but on the Friday and Saturday flew some lovely and unique formation passes together marking the bombers crews of both the RAF and US Army Air Force during the Second World War. 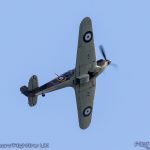 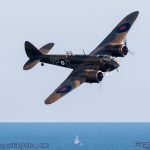 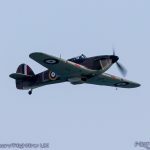 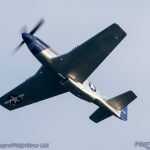 The loss of the Battle of Britain Memorial Flight did not mean piston engine fighters were missing from the Air Festival line-up. 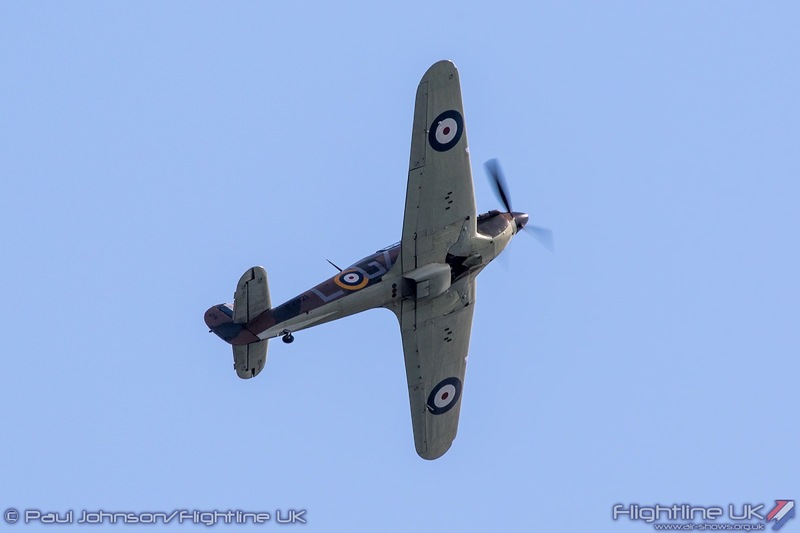 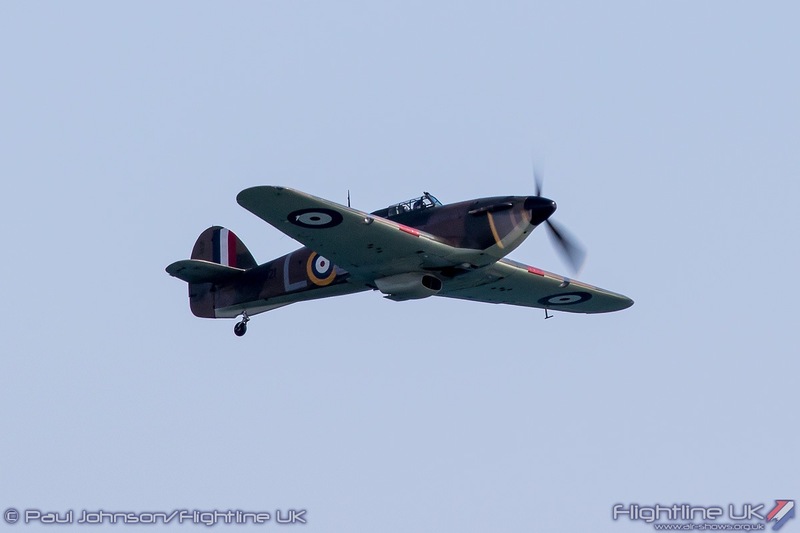 Saturday’s display saw an appearance by the Biggin Hill Heritage Hangar’s Hawker Hurricane X flown by Clive Denney while the Boultbee Flight Academy send both their Supermarine Spitfire IX flown by Matt Jones and North American P-51D Mustang “Miss Helen” over the opening two days. 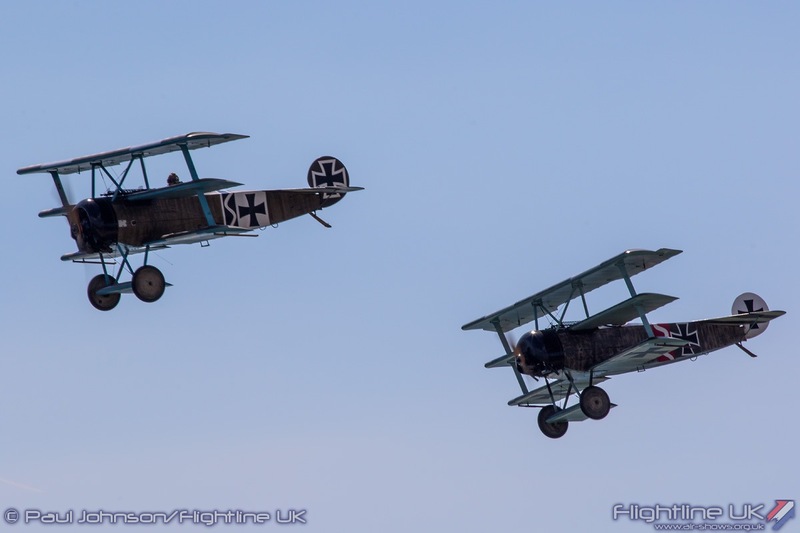 Aerial combat from the First World War was also remembered during Saturday’s display with the Great War Display Team making their Air Festival debut. 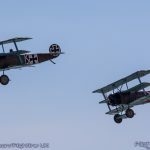 The team flew seven of their aircraft including pairs of RAF SE5as and Fokker Dr1s, a Junkers CL1, a RAF BE2c and the Sopwith Triplane. 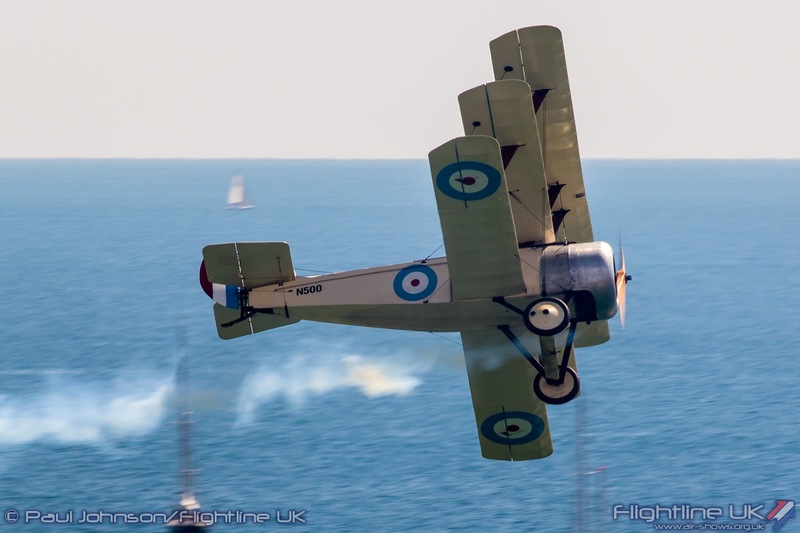 Their routine of swirling dogfights looked stunning over the amphitheatre of the Bournemouth display area and the blue waters. 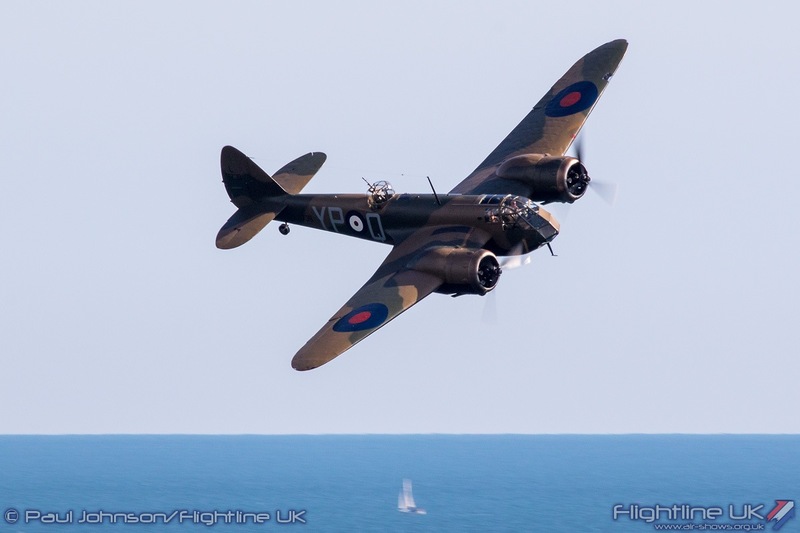 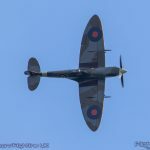 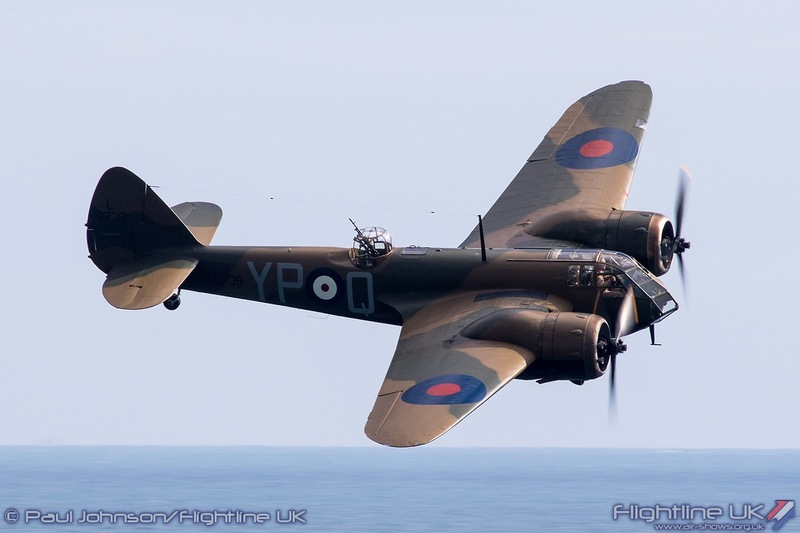 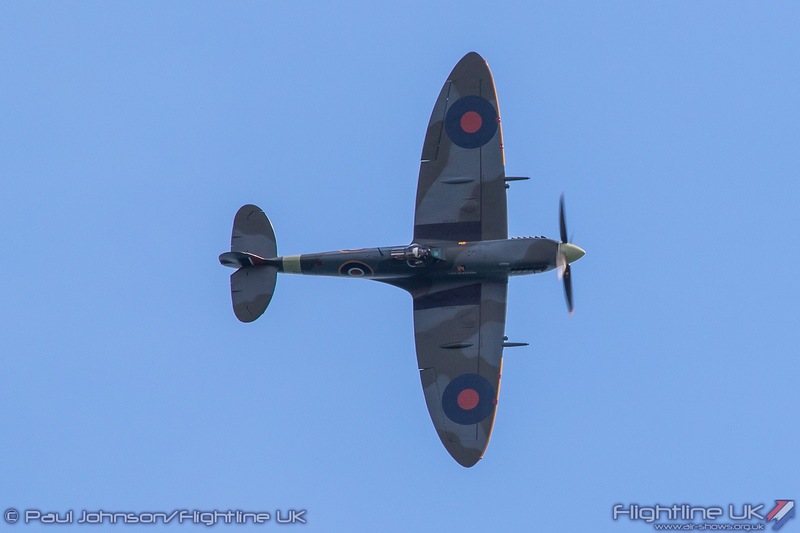 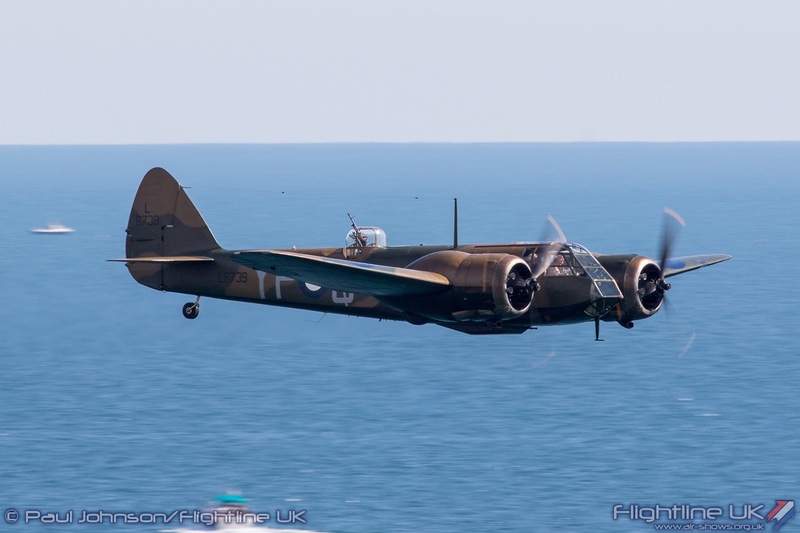 Over the three days that flying displays took place, Bournemouth welcomed a varied collection of classic jets. 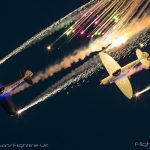 The Norwegian Air Force Historical Squadron made an impressive contribution to the show. 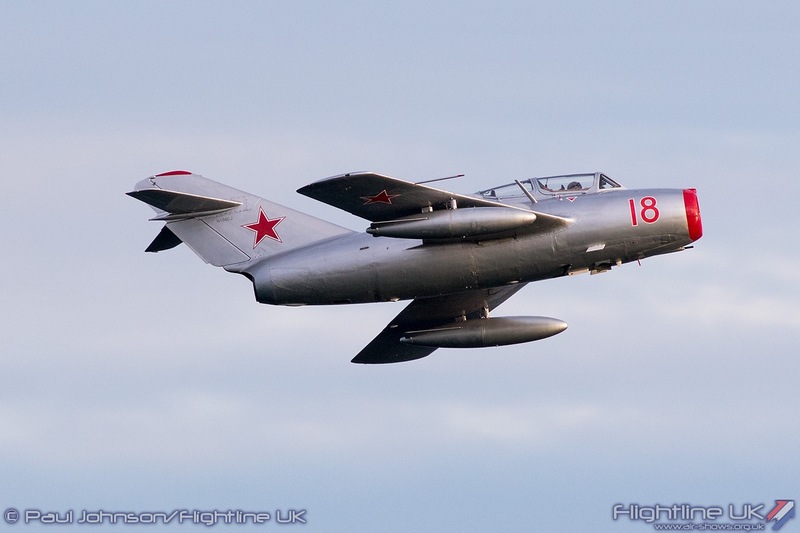 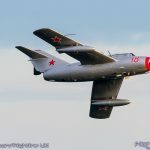 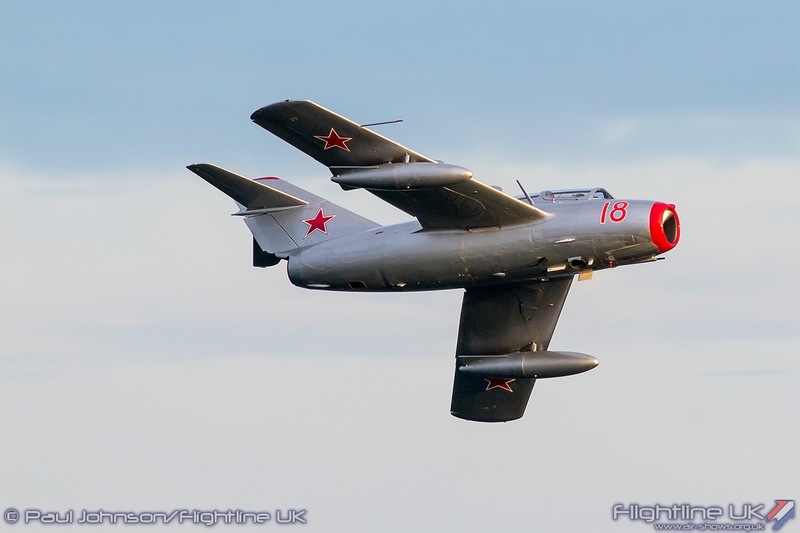 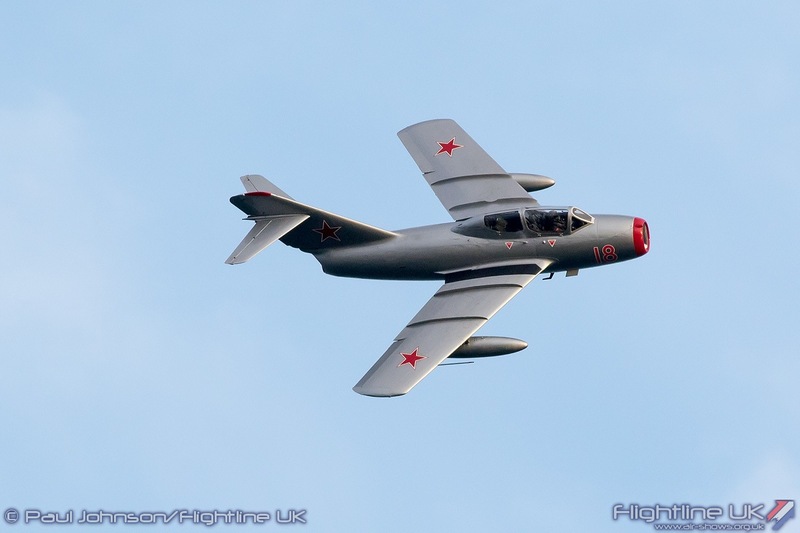 On Thursday and Friday, Kenneth Aarkvisla flew solo displays in the Squadron’s Mikoyan-Gurevich MiG-15UTi. 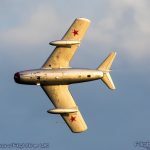 On Thursday, the MiG displayed in the early evening sunlight and the silver schemed jet looked subline in the golden light. 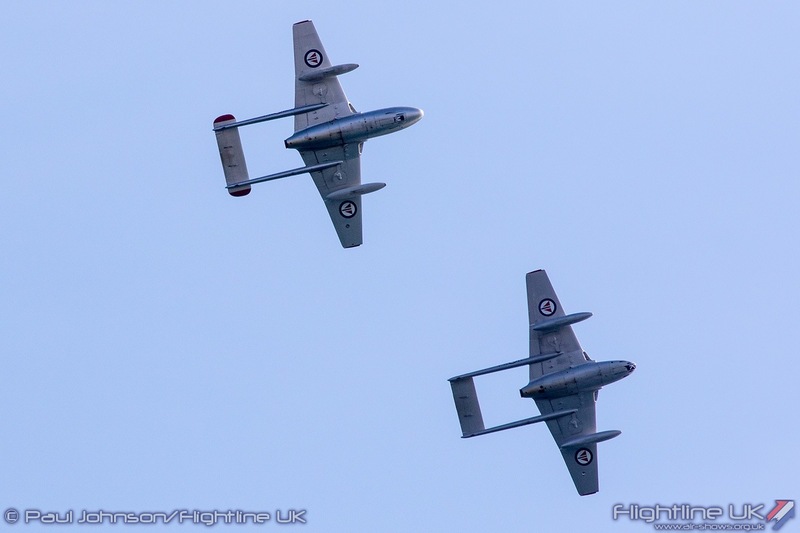 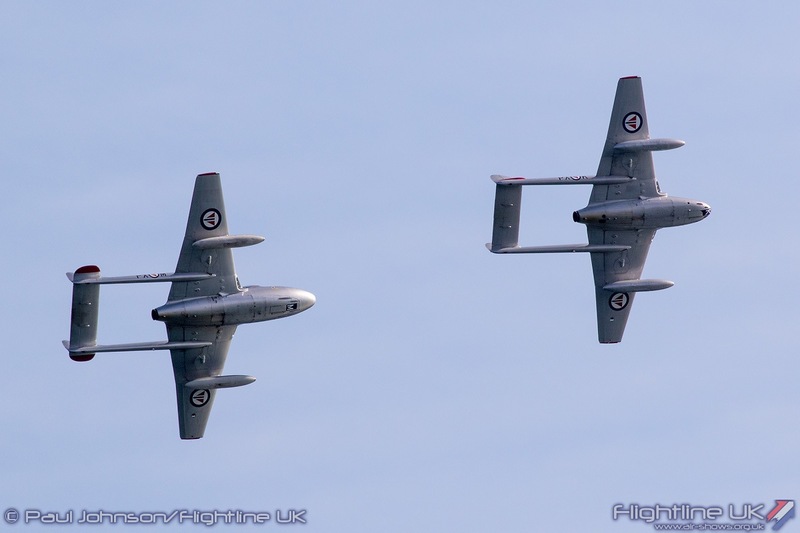 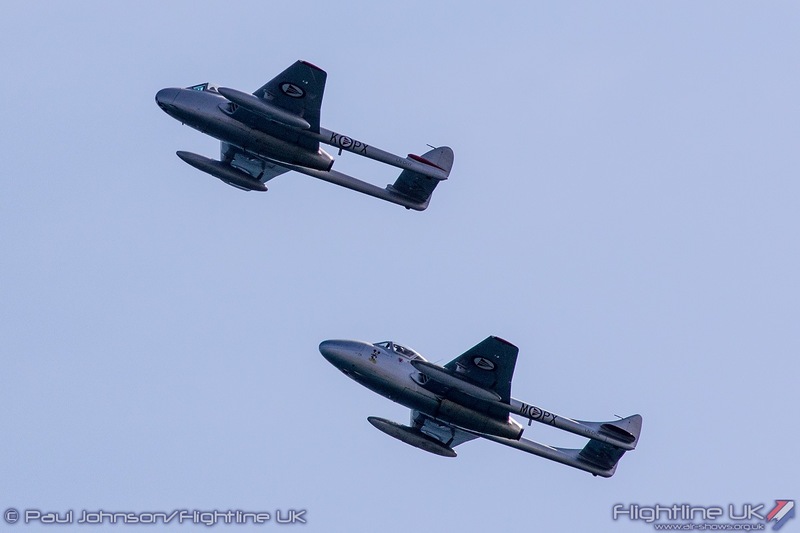 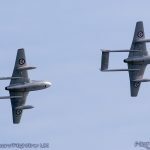 Saturday’s main flying display was closed by the Squadron’s pair of de Havilland Vampire FB52 and T55 flying an close formation routine of gentle aerobatics in the clear blue skies. 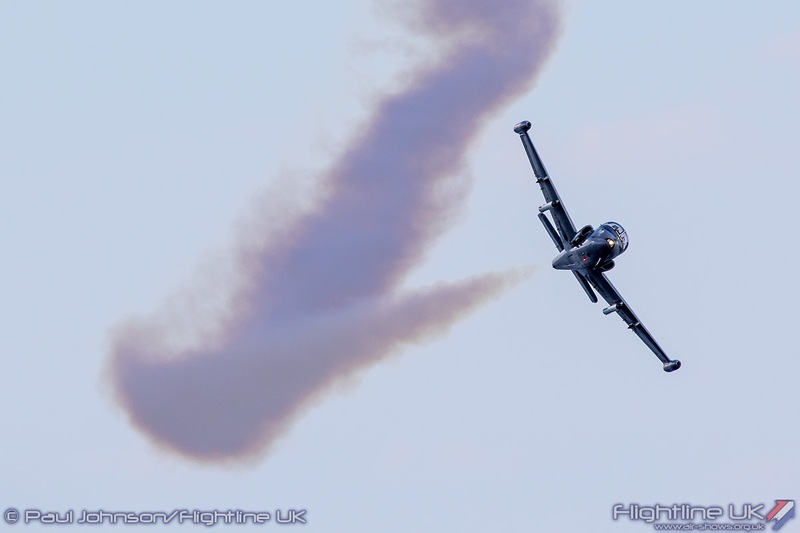 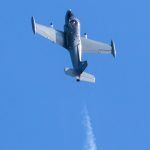 After his first appearance at the 2016 Air Festival, Mark Petrie returned with his BAC Strikemaster Mk82. 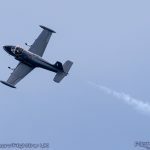 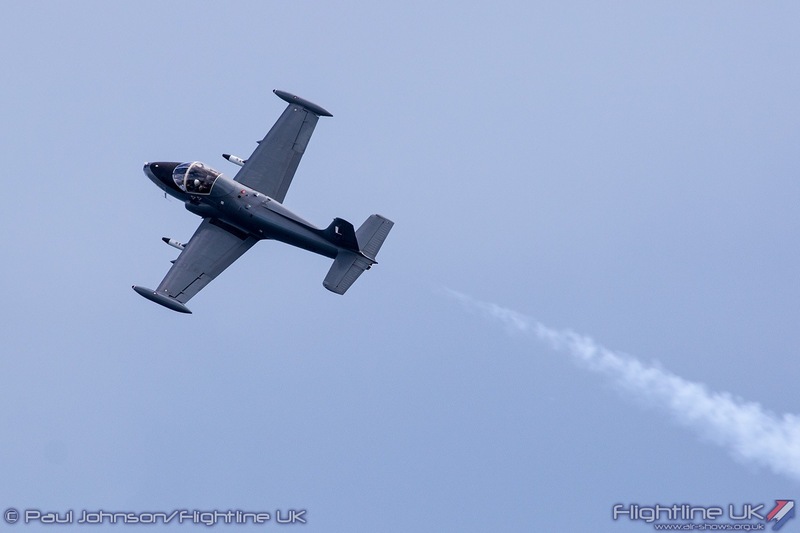 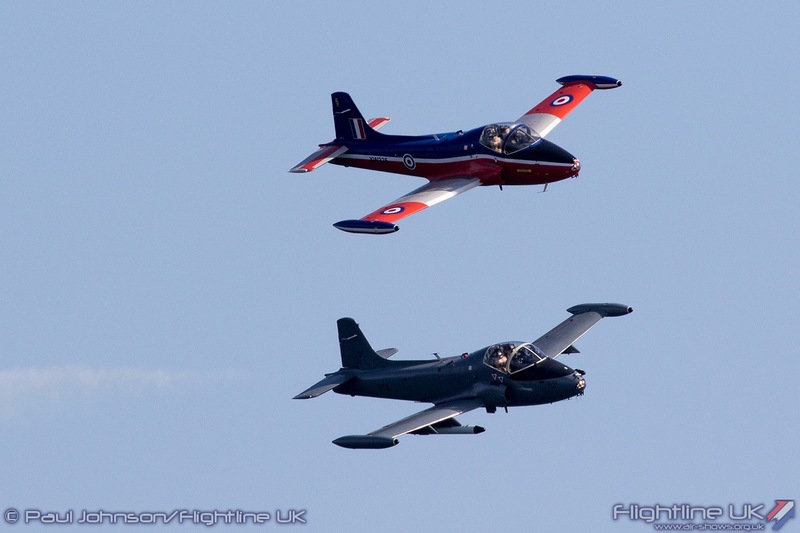 On Friday, he performed a solo aerobatic routine but on Saturday he was joined by John Green flying a BAC Jet Provost T5. 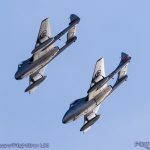 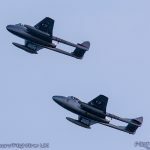 Like the Vampires, the pair took advantage of the clear conditions flying a pairs aerobatic routine including formation passes and some elegant tail-chasing. 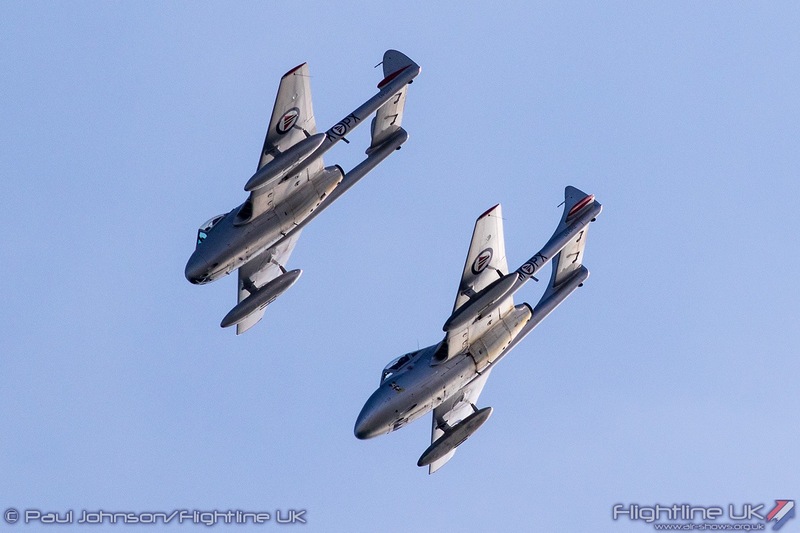 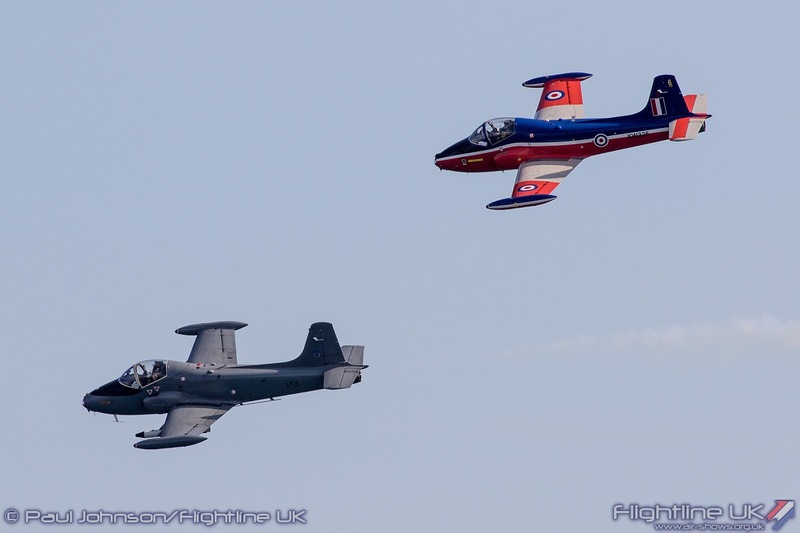 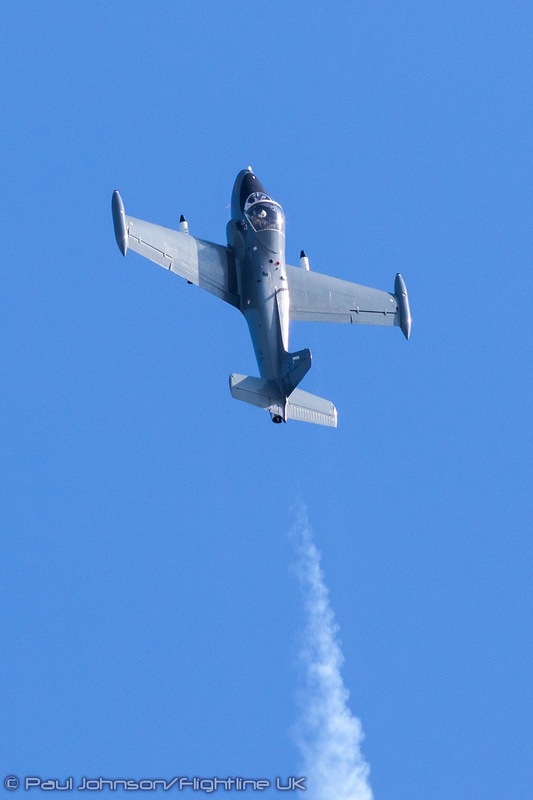 Sadly, the loss of the Sunday flying display meant that a planned formation finale featuring the Norwegian Air Force Historical Squadron, the Strikemaster and three Jet Provosts did not go ahead – hopefully there may be a chance next year! 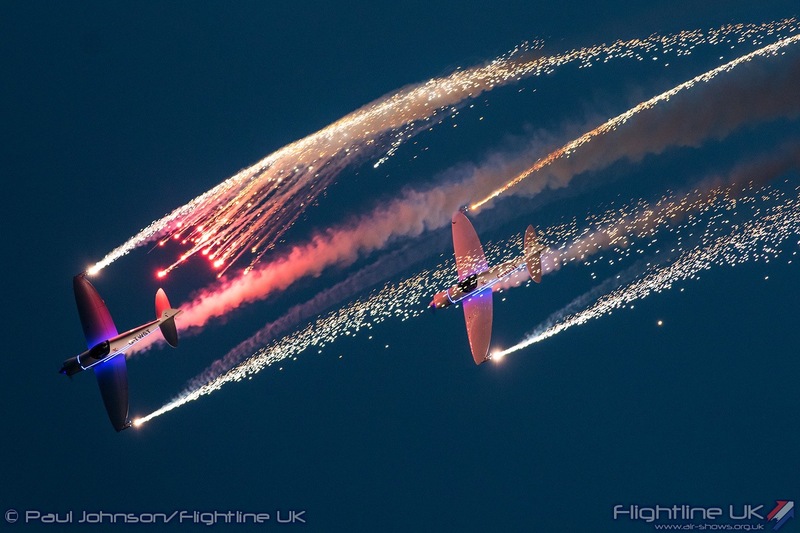 Adding some colour to each day’s flying displays were some of the best civilian display teams. 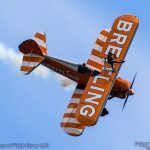 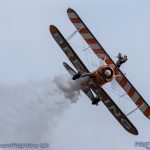 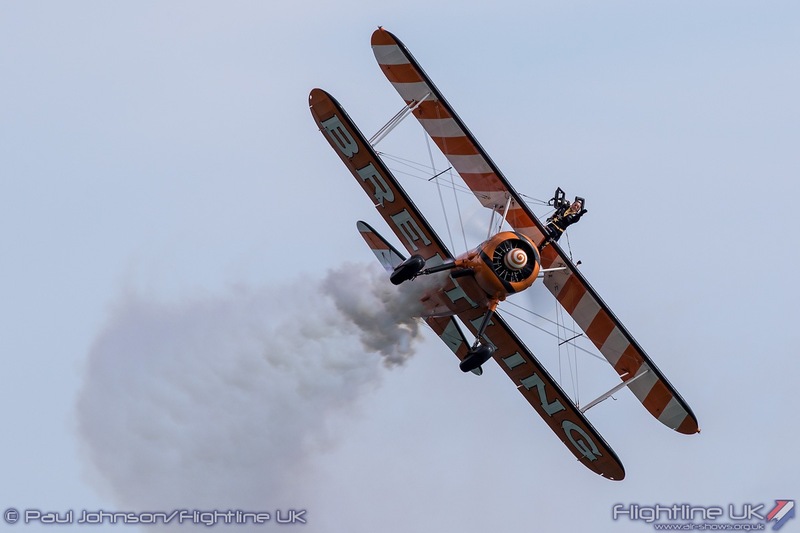 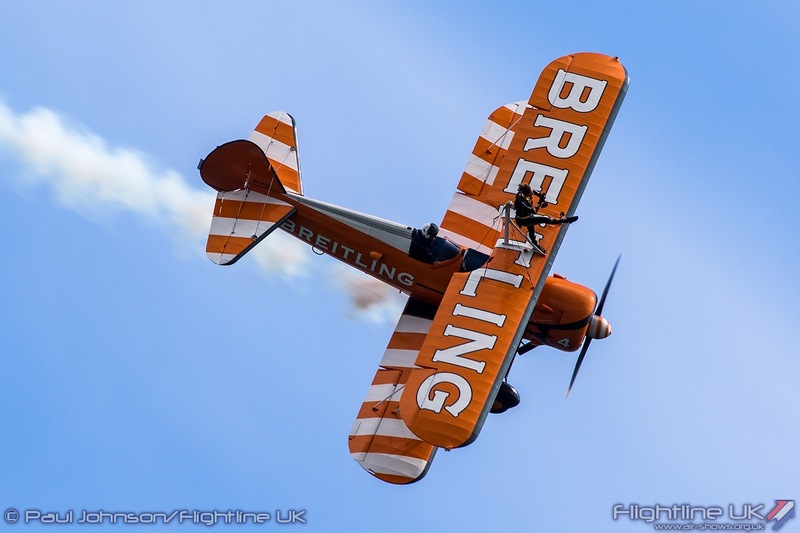 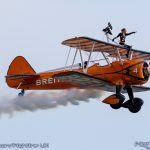 Thursday and Saturday saw a “Super-solo” from the Breitling Wingwalkers. 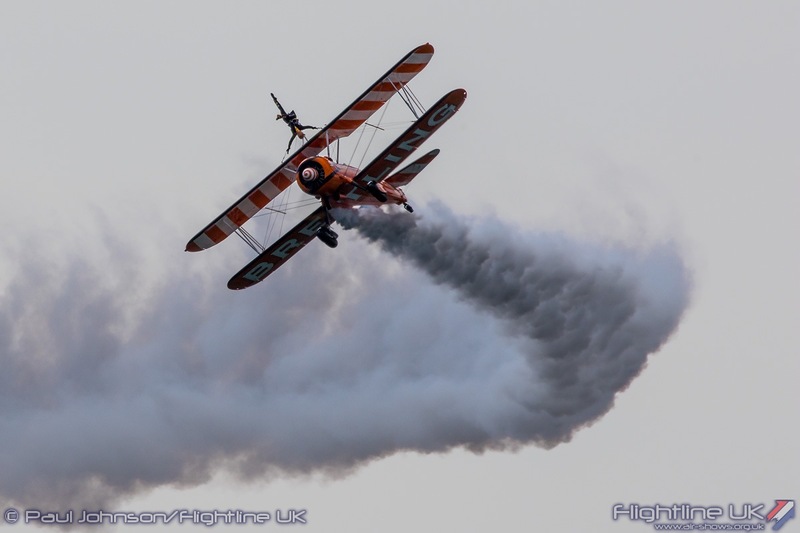 So busy are the team that each display saw a different pilot and wingwalker. 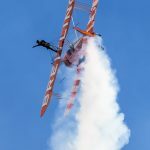 Thursday saw Dave Barrell and Gina Marshall perform over Bournemouth while Saturday saw Nick Barnard fly with Kirsty Joly on the wing. 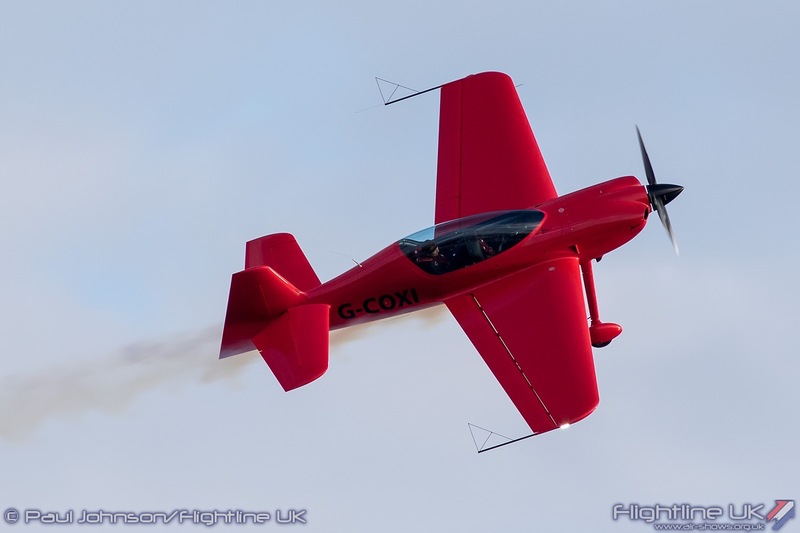 Solo unlimited freestyle aerobatics British Champion pilot Gerald Cooper flying an XtremeAir XA42 rather than his usual XA41. 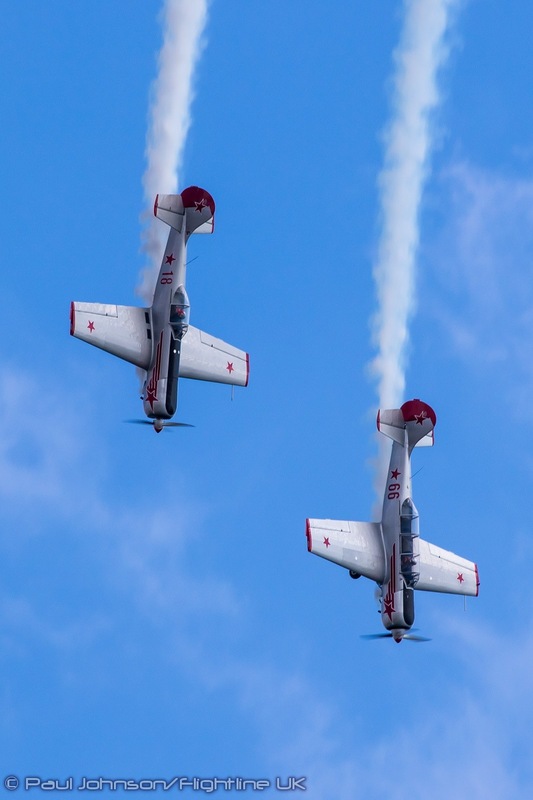 Immediately after the Air Festival, Gerald was off to South Africa to compete in the World Aerobatic Championships and his own aircraft was in transit to the competition. 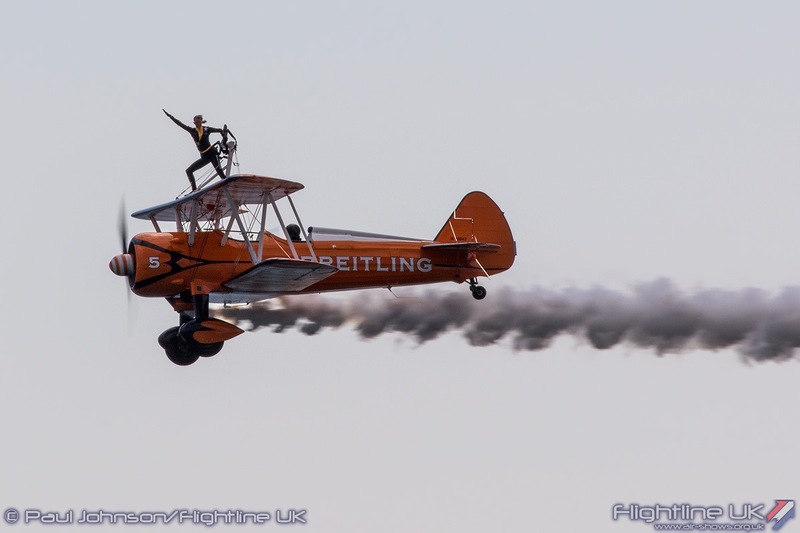 Gerald’s routines are a non-stop blast of constant manoeuvring with the aircraft continually rolling and pitching around the sky. 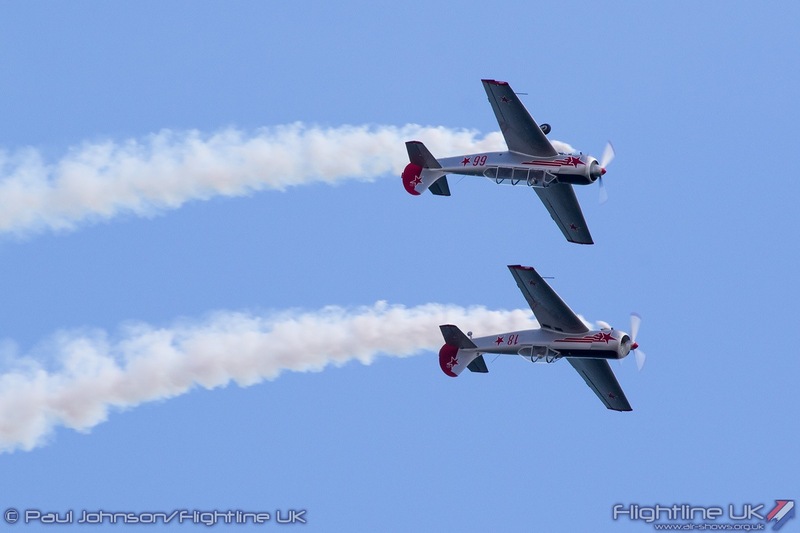 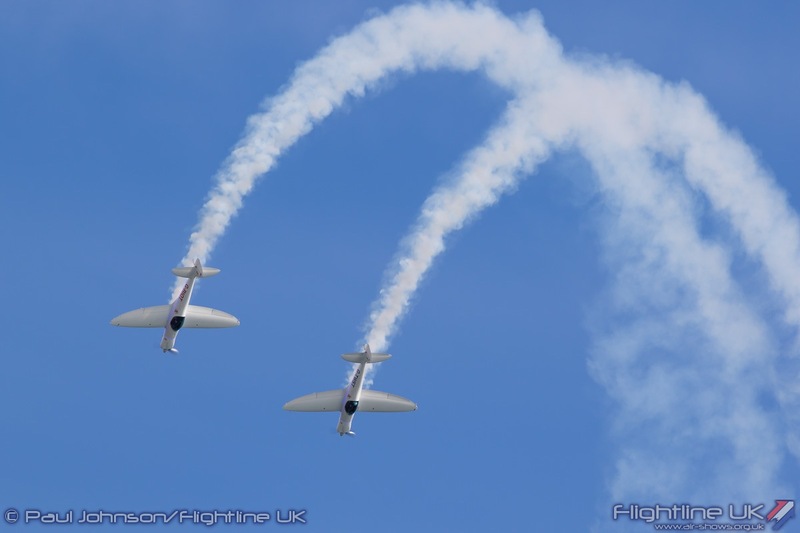 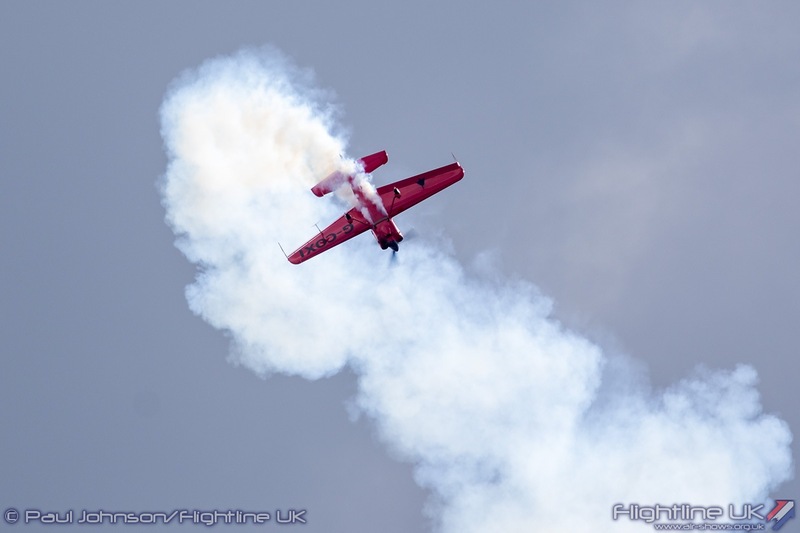 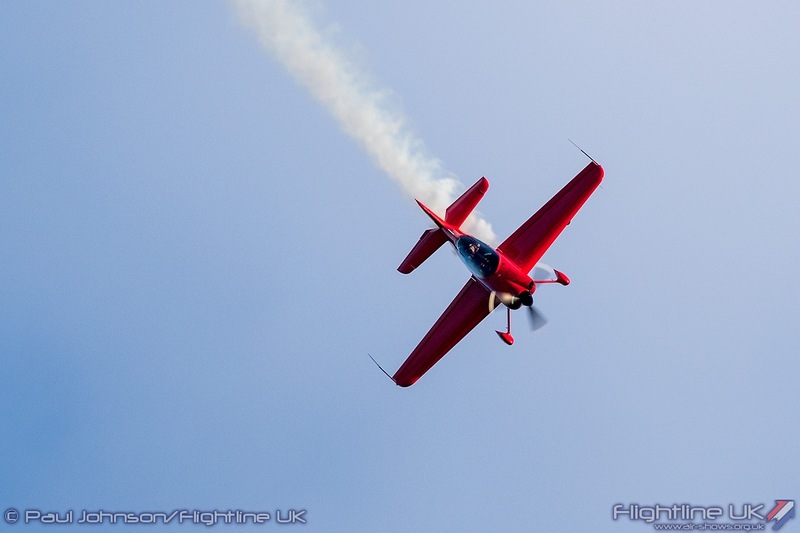 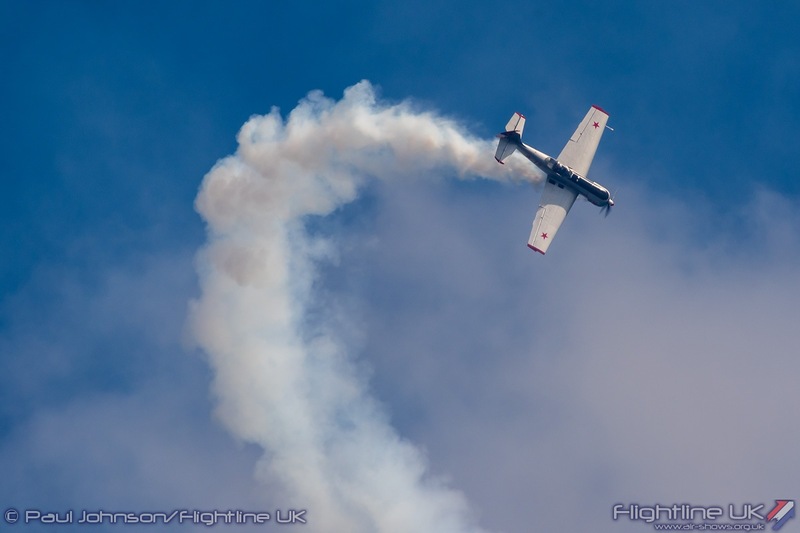 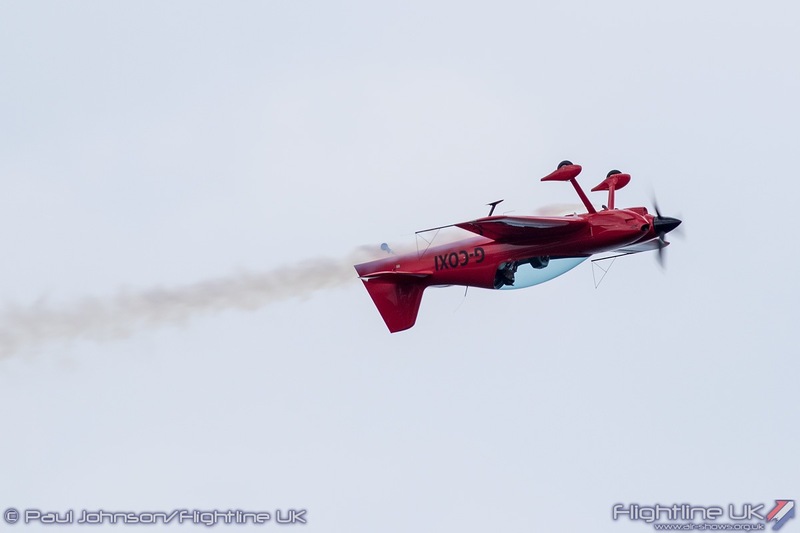 One of the first aerobatic teams to appear at the Air Festival were the Yakovlevs who are based at nearby Henstridge. 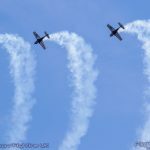 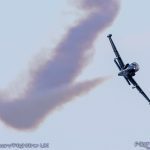 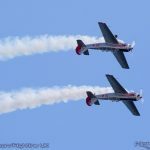 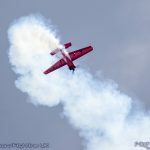 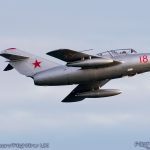 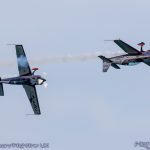 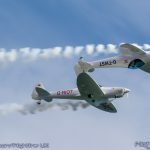 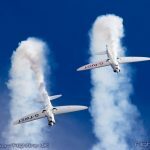 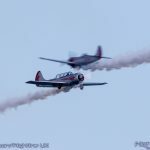 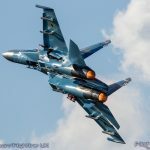 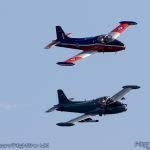 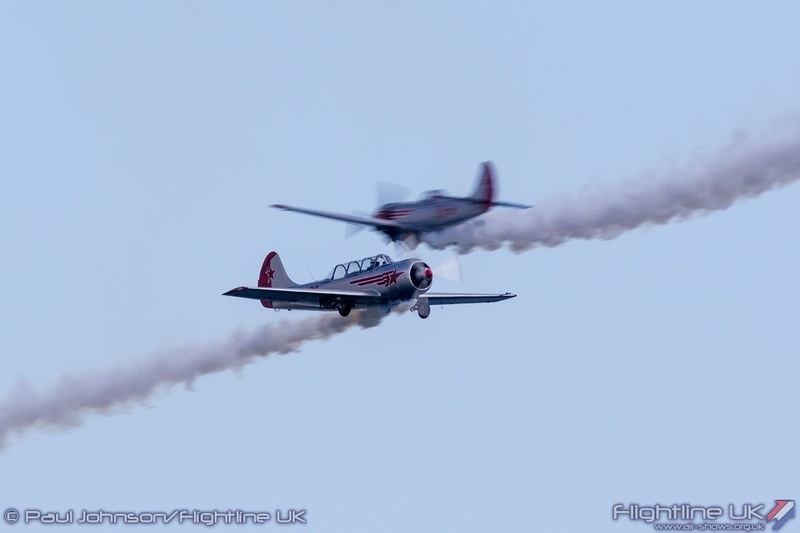 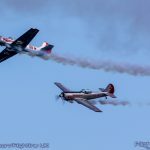 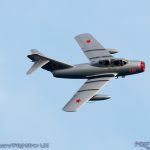 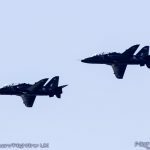 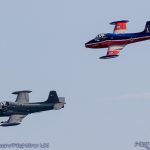 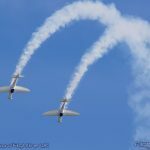 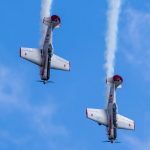 On Saturday, they returned after an eight-year absence performed a pleasing duo display with a Yakovlev Yak-52 and Yak-50. 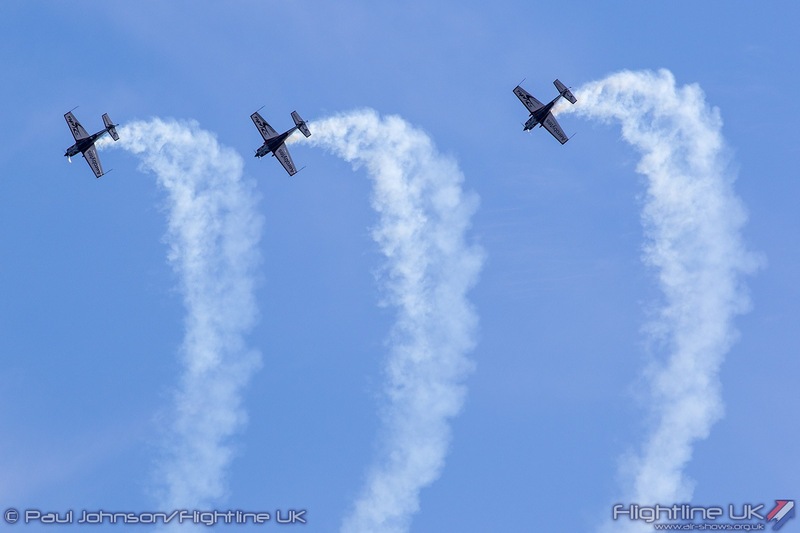 More formation aerobatics came from The Blades Aerobatic Team who have flown at every Air Festival. 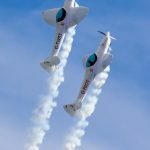 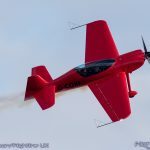 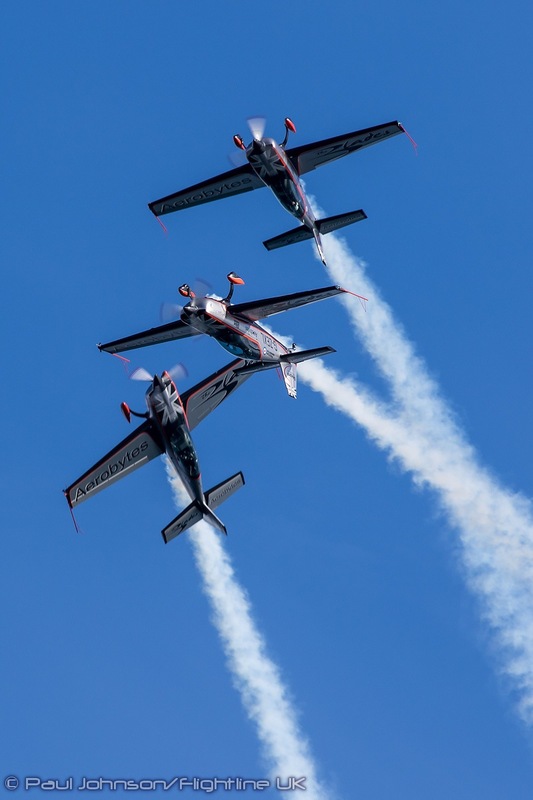 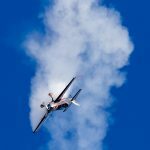 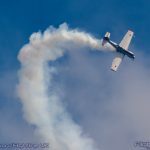 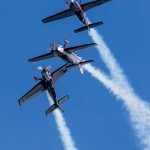 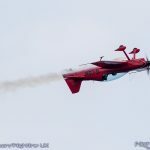 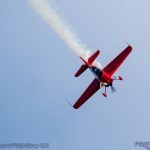 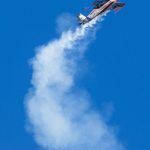 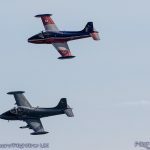 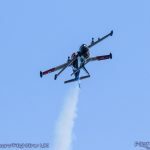 Ben Murphy recently took over the role of Blade 1, but this year the Air Festival clashed with the Red Bull Air Race in Porto where Ben was competing in the Challenger Cup. 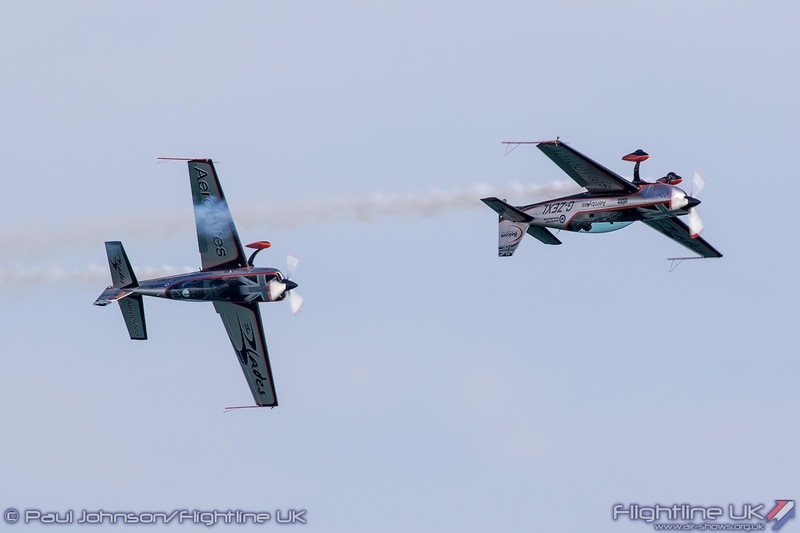 This did not the team appearing, albeit as a three-ship with 2016 leader Mark Cutmore taking over the role of Blade 1 leading Blade 3 Kirsty Murphy and Blade 4 Andy Evans. 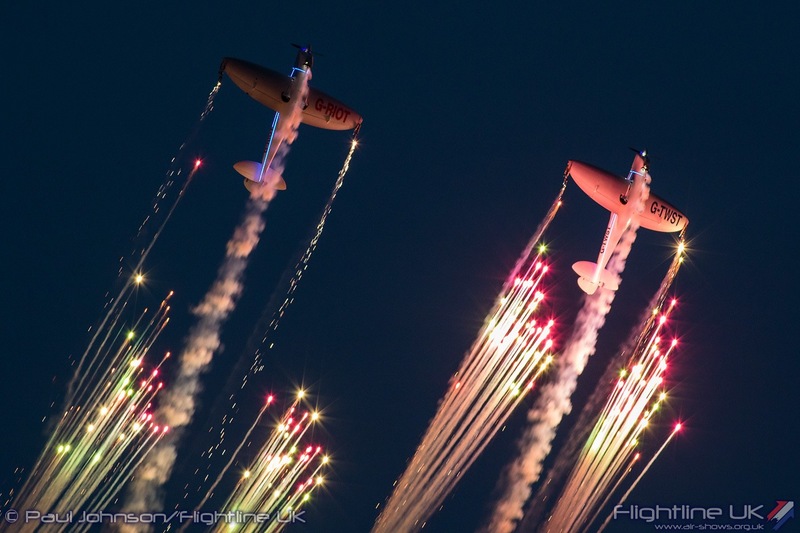 All three Night Air Dusk displays took place this year in near perfect conditions. 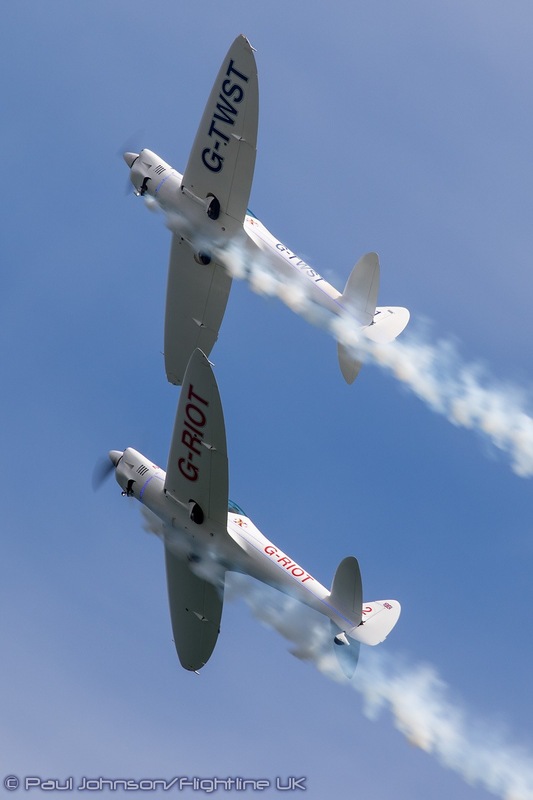 They were opened by the Twister Aerobatic Team led by Peter Wells with wingman Chris Burkett. 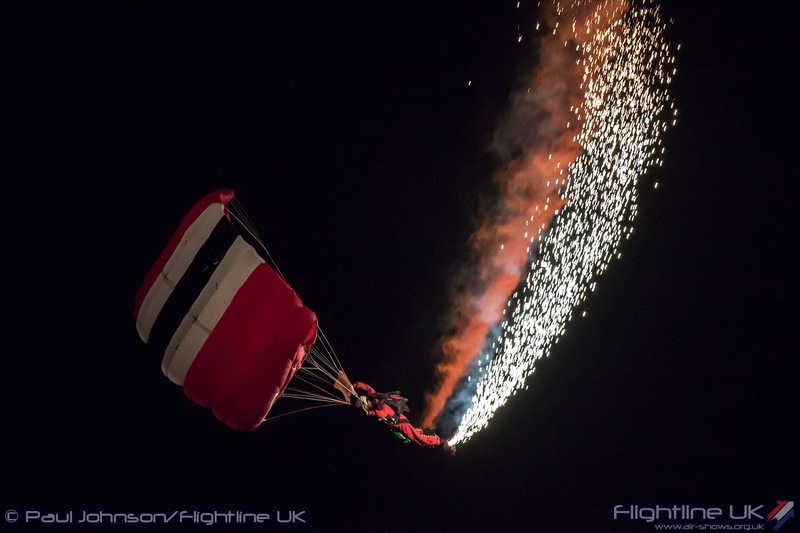 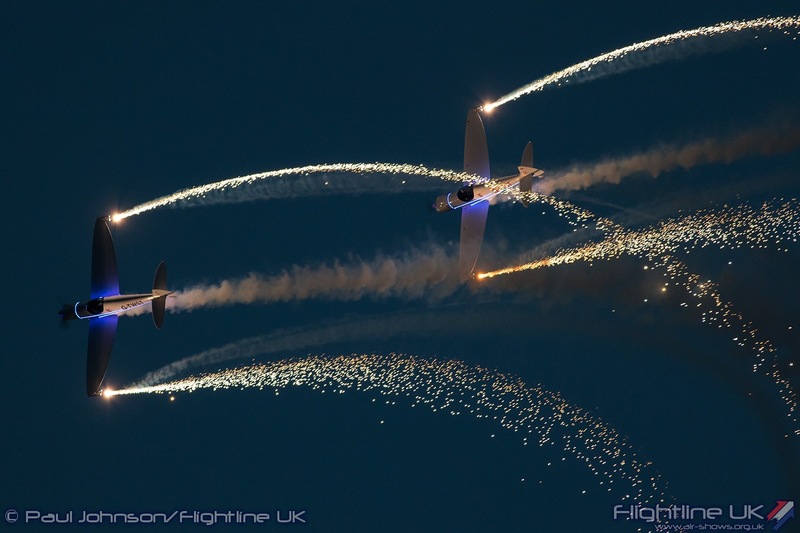 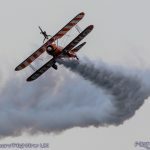 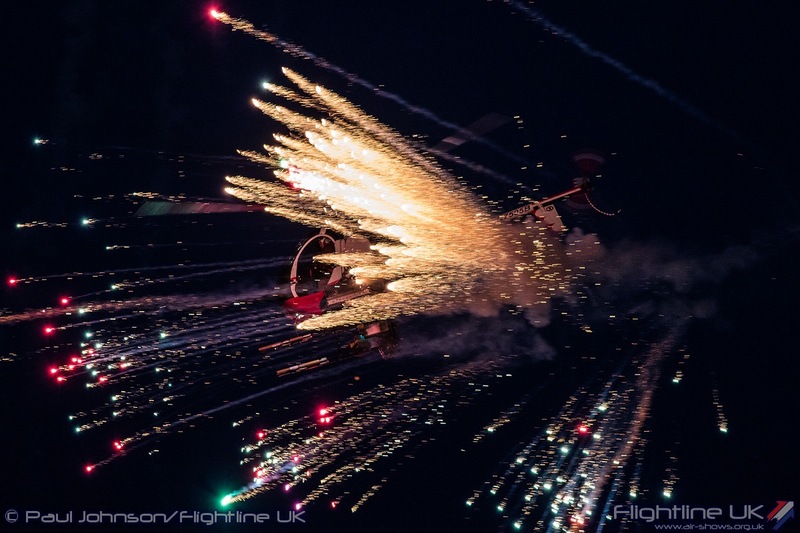 Peter flew in the first ever Night Air flying display in 2010 which was also the first ever Twister pyrotechnic display. 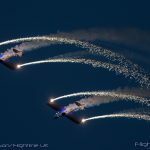 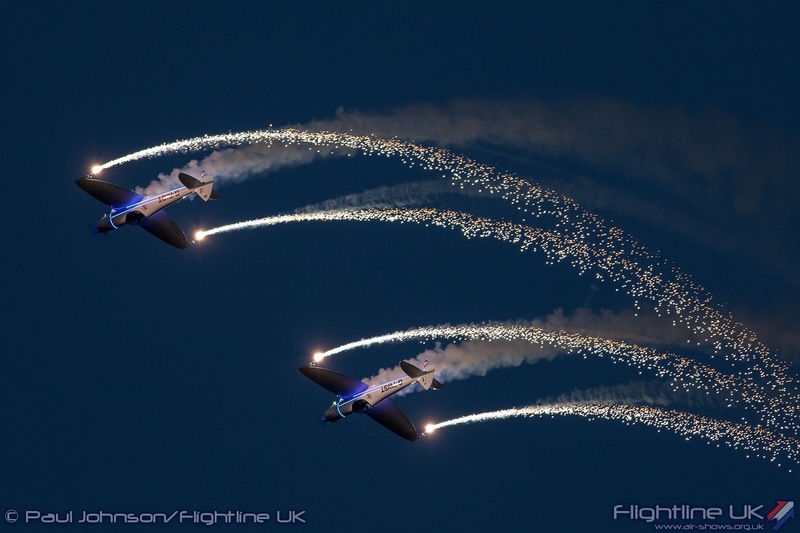 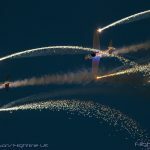 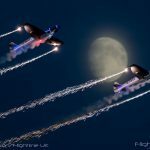 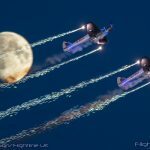 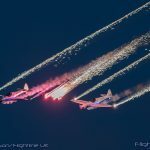 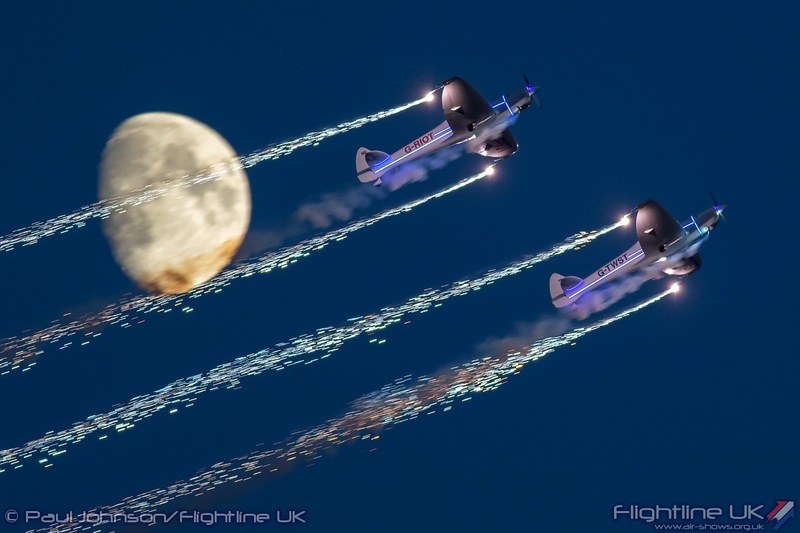 With a moonlit backdrop, the elegant routine of gentle loops and barrel rolls with streams of sparks streaming from the aircraft wingtips was just a magical start to Night Air. 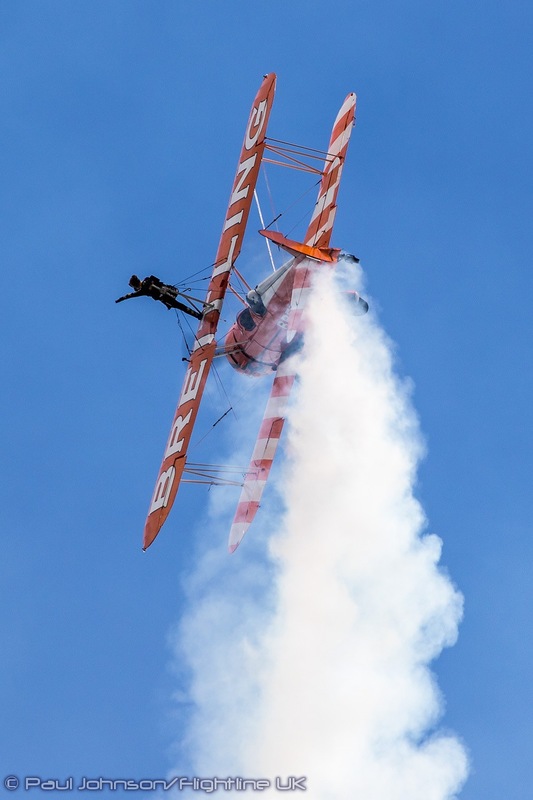 In contrast to the grace of the Twisters was the spectacular given by Brendan O’Brien flying OTTO the Helicopter. 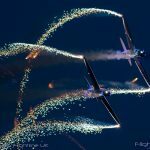 OTTO was a legend of the US display circuit flying all sorts of different displays including night shows. 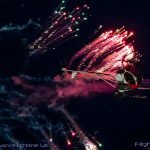 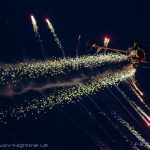 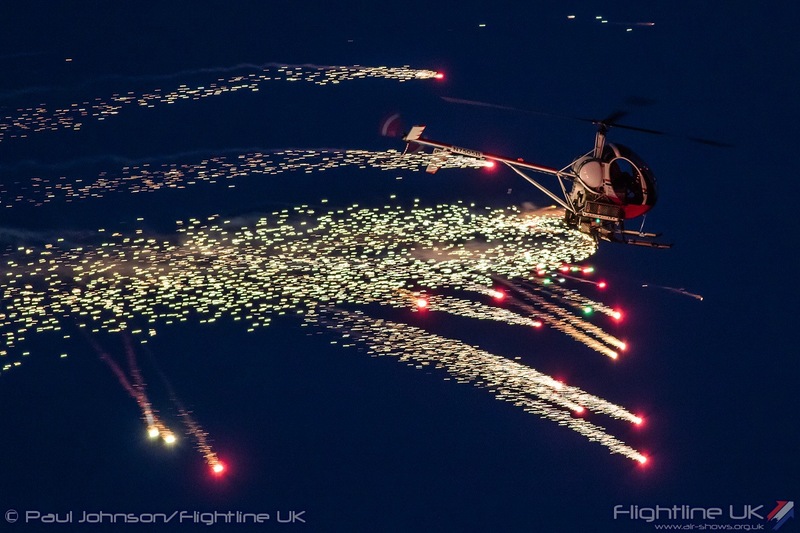 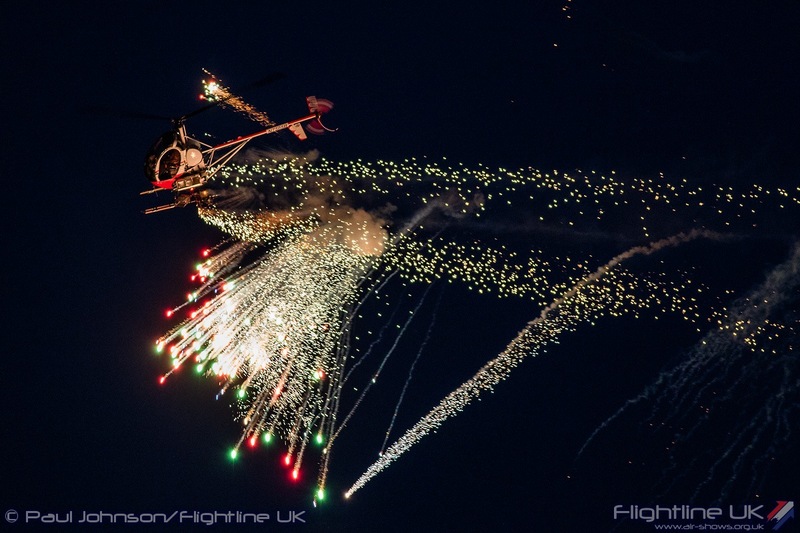 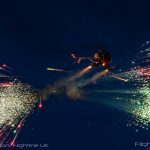 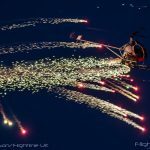 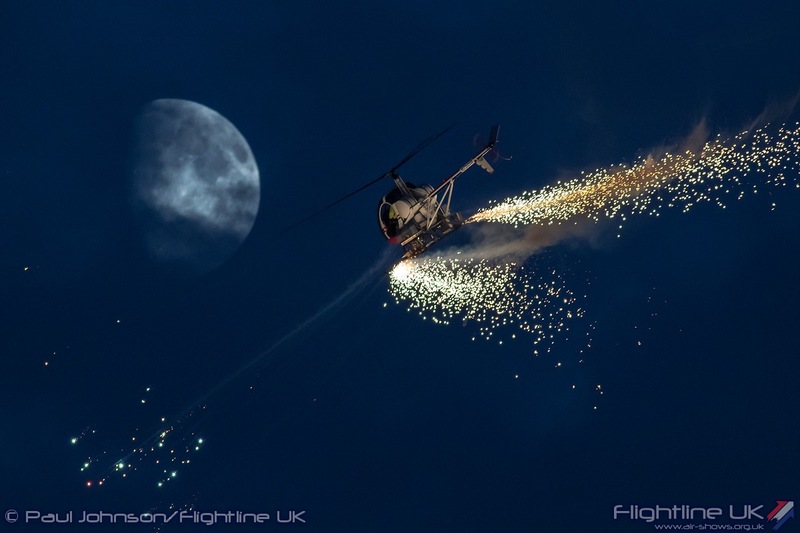 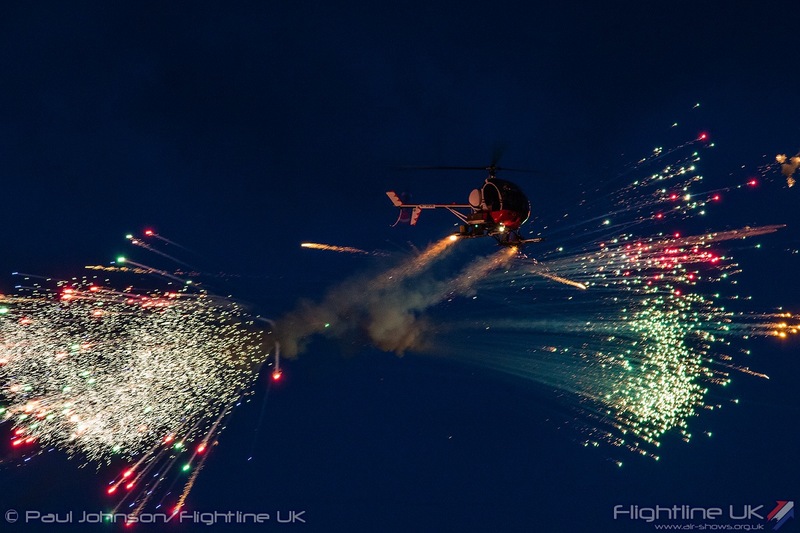 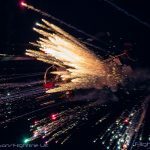 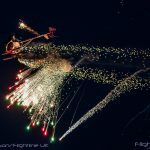 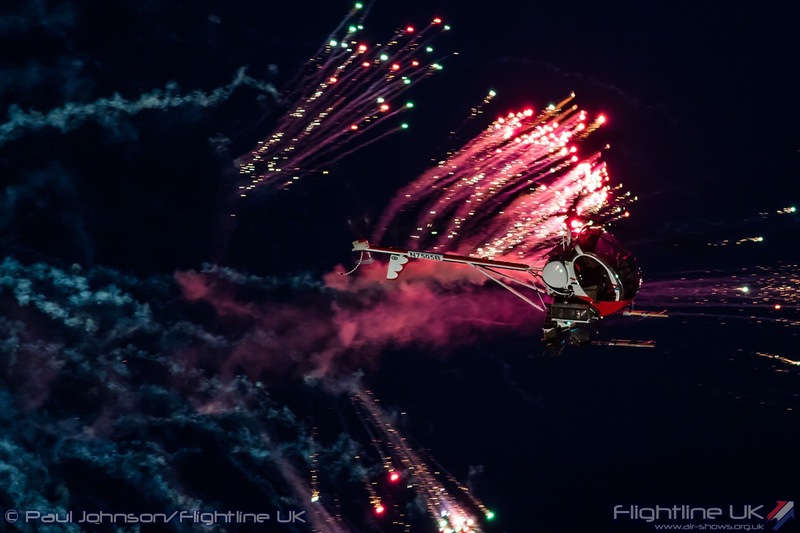 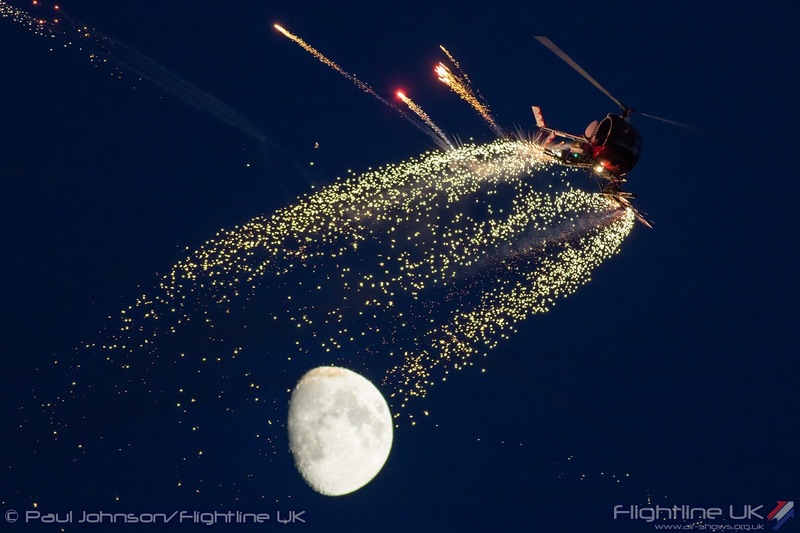 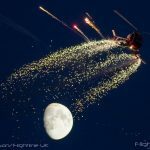 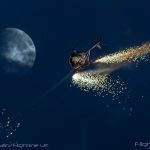 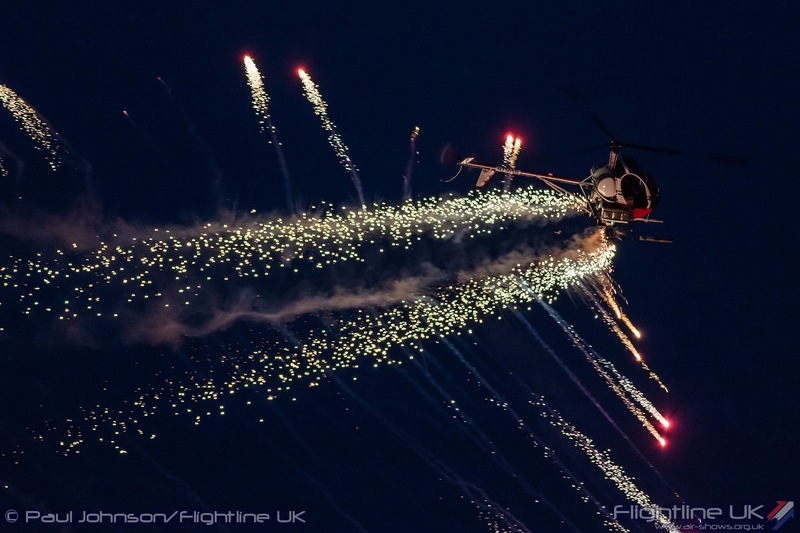 OTTO Is actually a Schweizer 300C, a relatively small training helicopter but it can carry a serious number of fireworks as demonstrated by Brendan’s routine which filled the darkening sky with a pulsating mass of colour and noise! 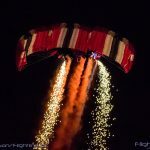 Night Air was closed by the British Army’s Red Devils Parachute Display Team who were absolutely spectacular. 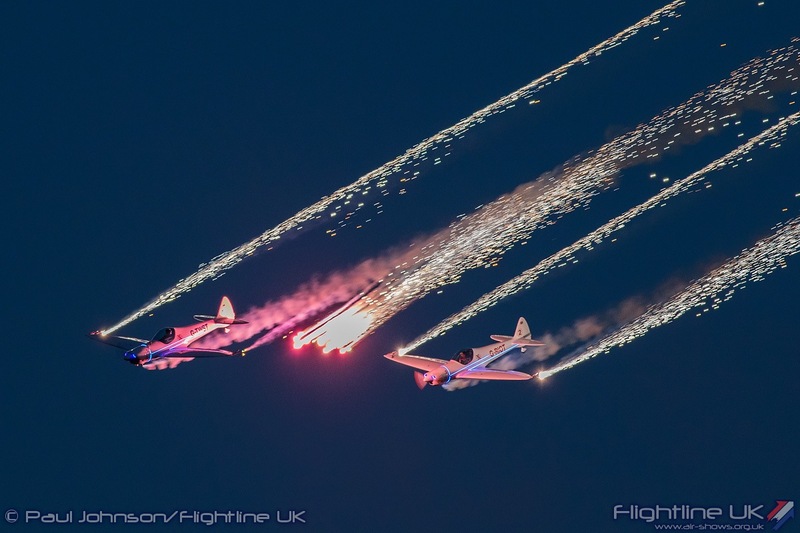 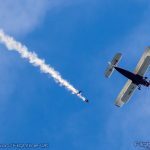 Jumping from the same Antonov An-2 as the Tigers, the first sign they were out of the aircraft were some fainted spots of light in the sky slowly moving about. 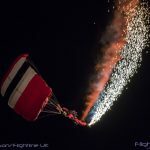 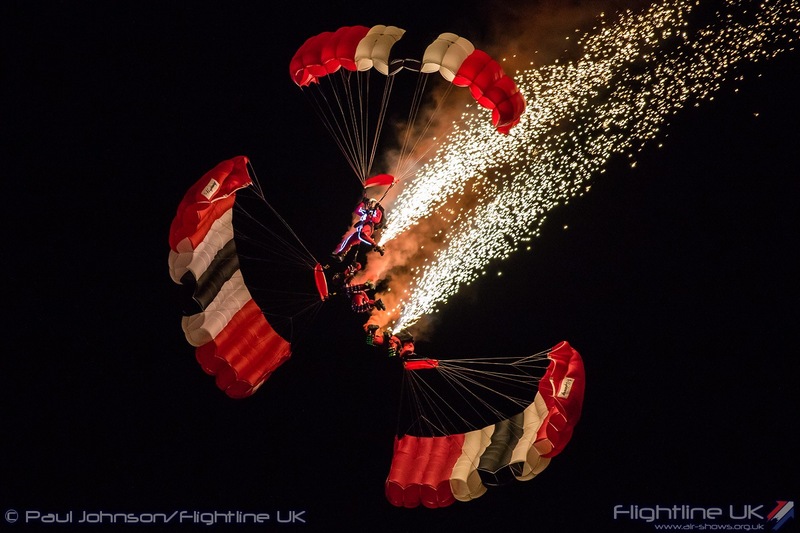 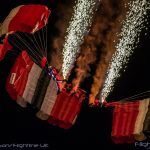 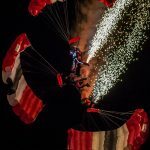 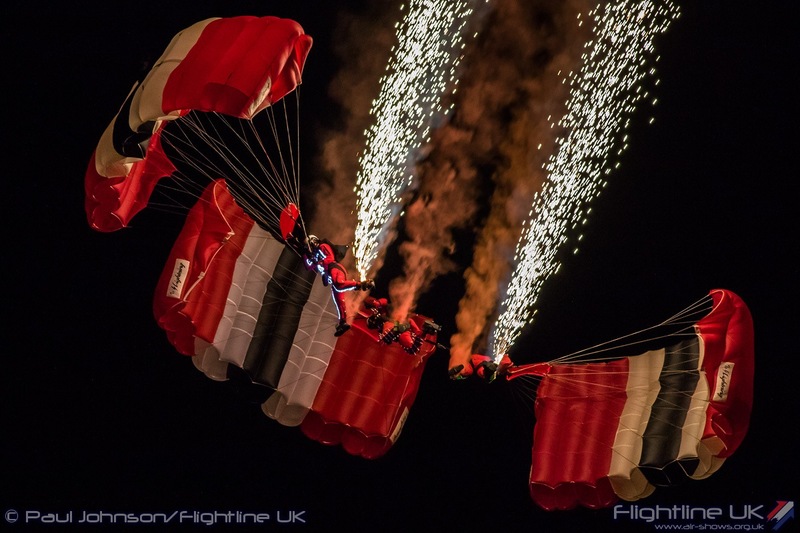 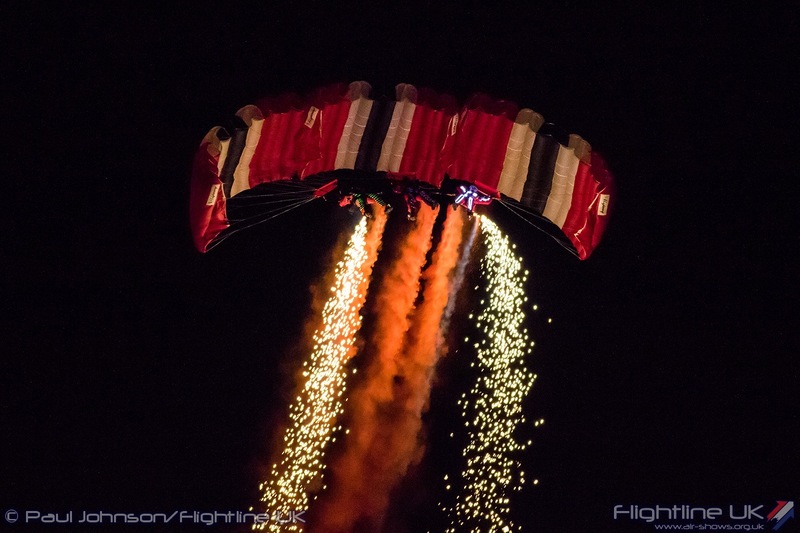 As they deployed their canopies the various members of the team fired their flares illuminating the bright red parachutes against the dark skies. 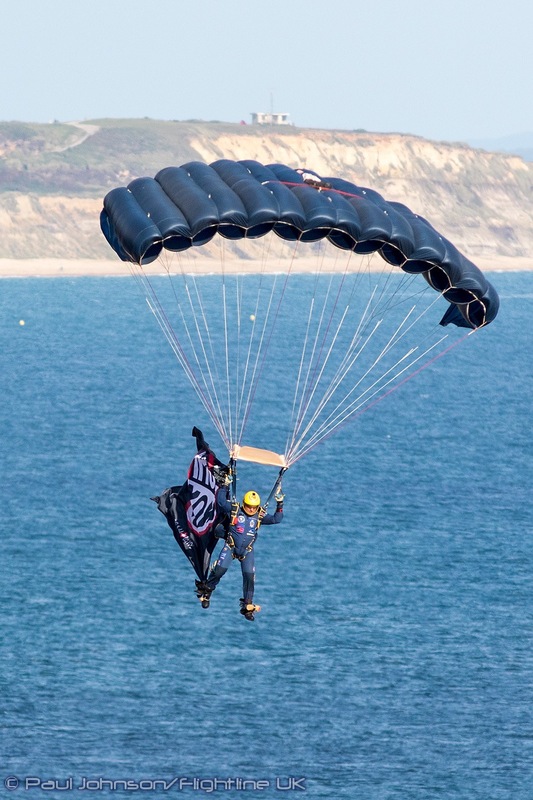 Their finale was some incredible relative canopy work from three members of the team right down to the cliff top level. 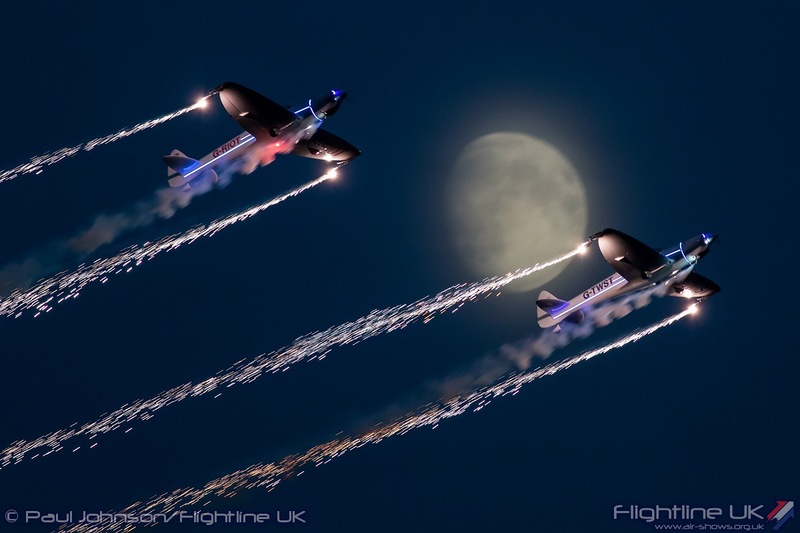 A truly fitting finale to each day’s flying. 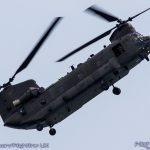 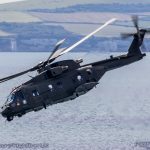 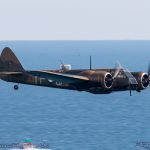 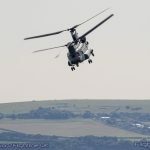 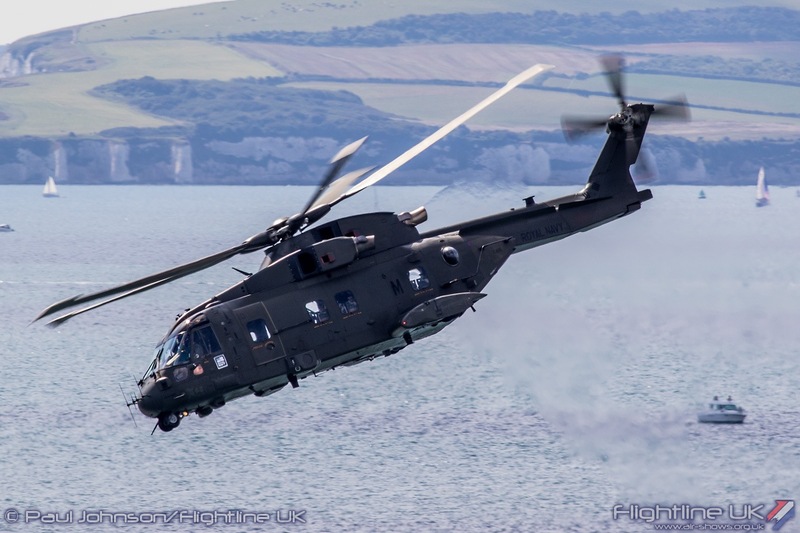 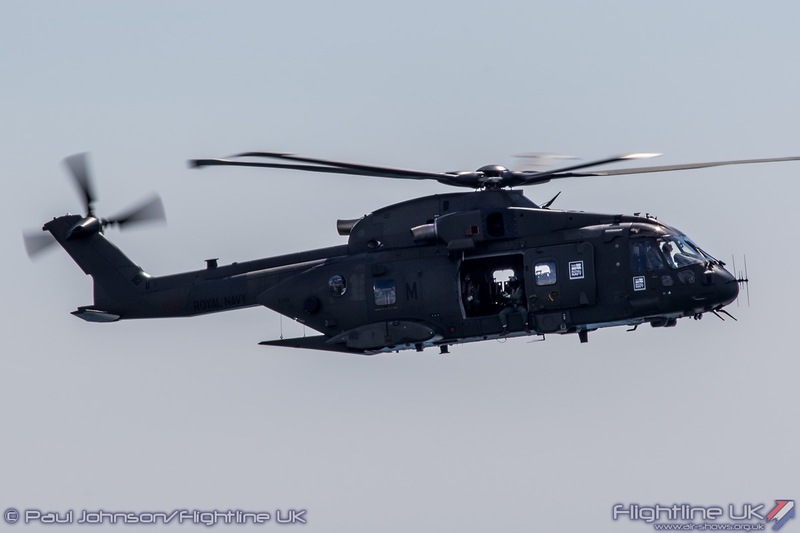 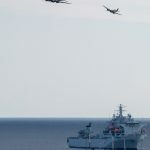 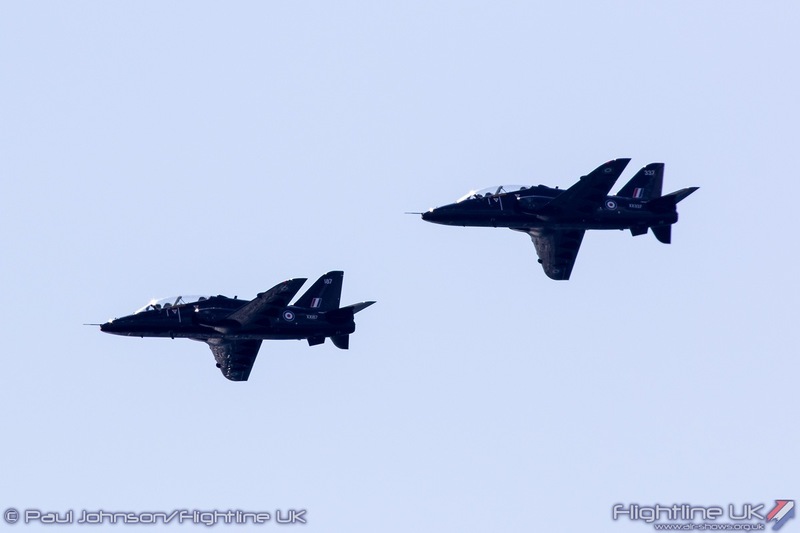 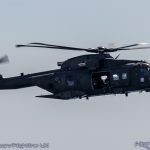 It is fair to say Bournemouth more than its fair share of challenges with a lack of RAF display teams and Royal Navy ships compared to previous years as well as very poor weather on the final day. 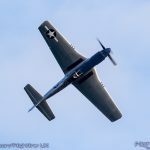 However, the Air Festival did not disappoint the crowds with some great entertainment on the ground and a good selection of aircraft old and new in the air. 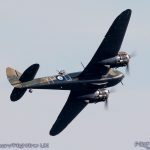 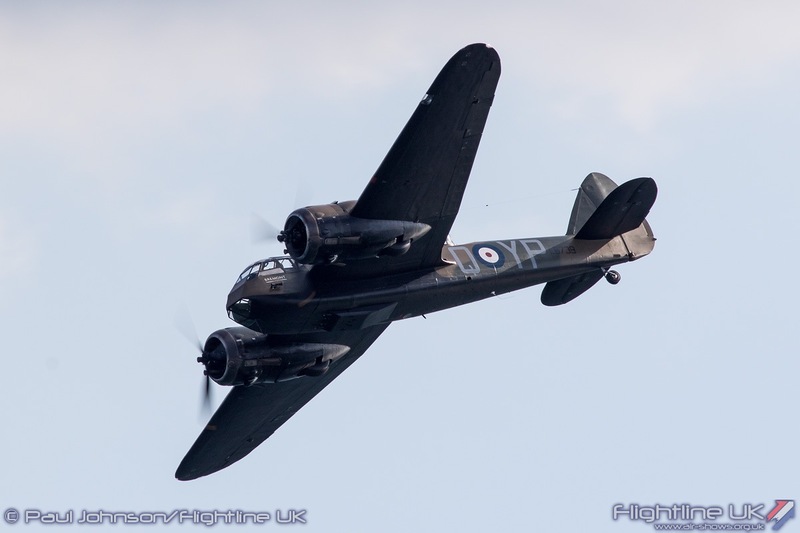 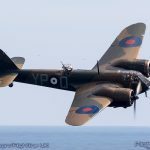 As well as old favourites, there were plenty of new aircraft to the Air Festival with perhaps the Blenheim standing out. 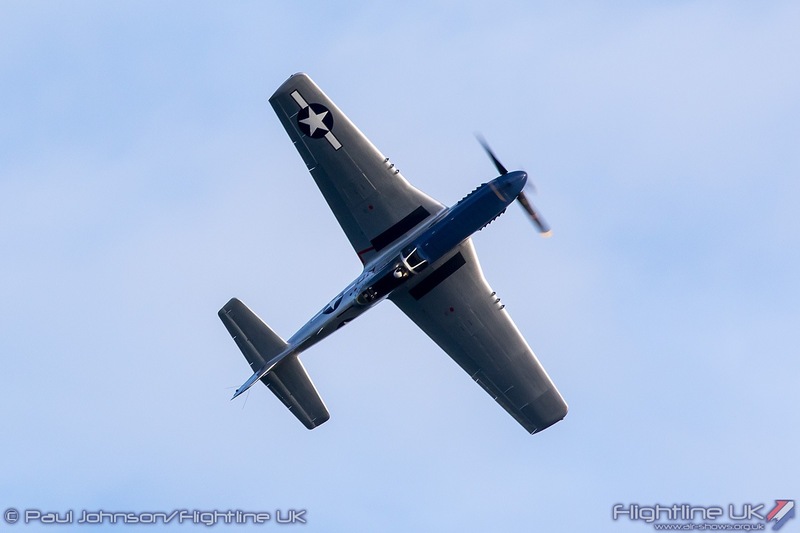 Thursday’s flying was also particularly nice involving more aircraft and also taking place later in the afternoon when the light was at its best. 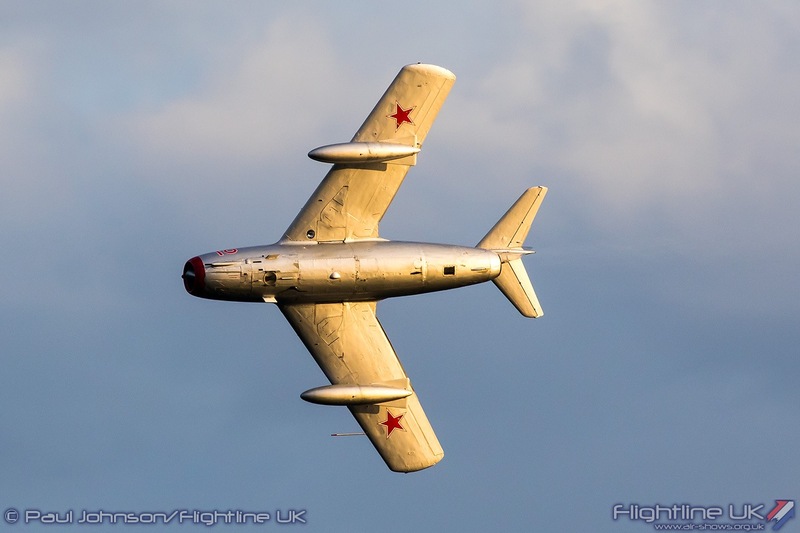 Certainly the warbirds and the MiG-15 looked epic against the late afternoon skyscape. 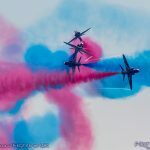 It was sad the flying display were curtailed on the final day as they would have featured some lovely formations. 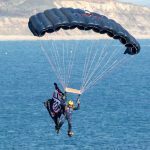 However, it was still a very fun weekend on the Dorset coast and we look forward to being back in 2018.